Superb sound quality, effortless sound yet small. Pros - Superb sound quality. Small footprint. Nicely made. Very powerful. 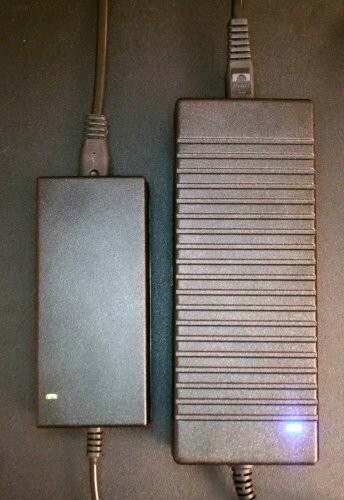 Cons - Perhaps the power brick but this does keep size down. I have to be honest up front. I tend to use headphones for most of my music listening these days. 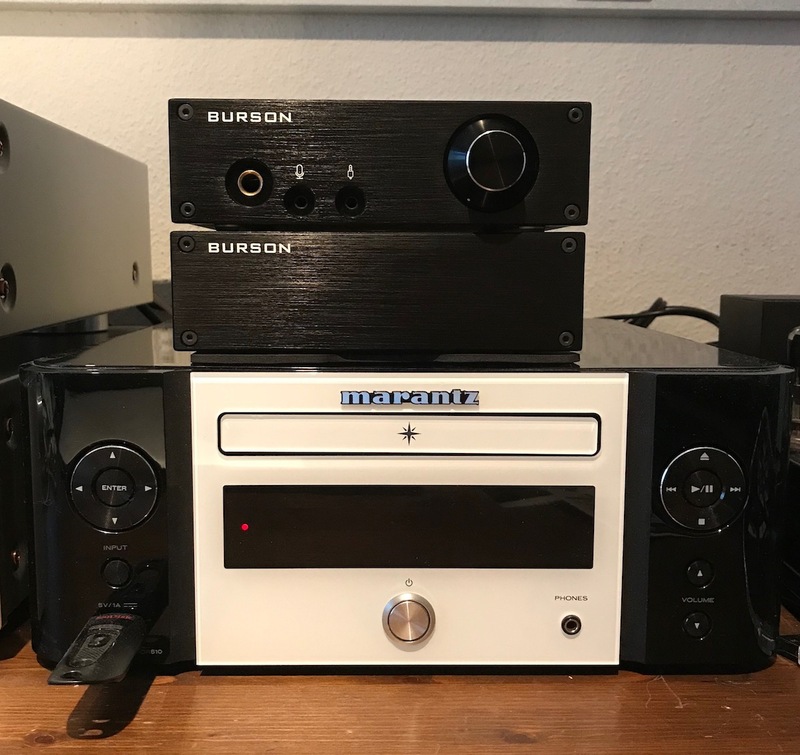 When Burson gave me the opportunity to review their Bang Power Amp I must admit I wondered whether my humble loudspeaker system would be up to the task of showing off any improvements in the audio chain. But then I thought - what the hell, let’s give it a try. I normally listen to a Sony micro system and Mission bookshelf loudspeakers. Although the system does have a CD player, I tend to listen to the Chromecast Audio most of the time. I have to say that the Chromecast Audio is an excellent piece of kit and more than up to the task of primary listening. My intention is to replace the Sony with the Burson amp and connect the Chromecast Audio directly to the amp - using either my phone or voice control via my Google Home Mini to control the volume. I thought you folks might be interested in hearing about what I’ve discovered and some thoughts. 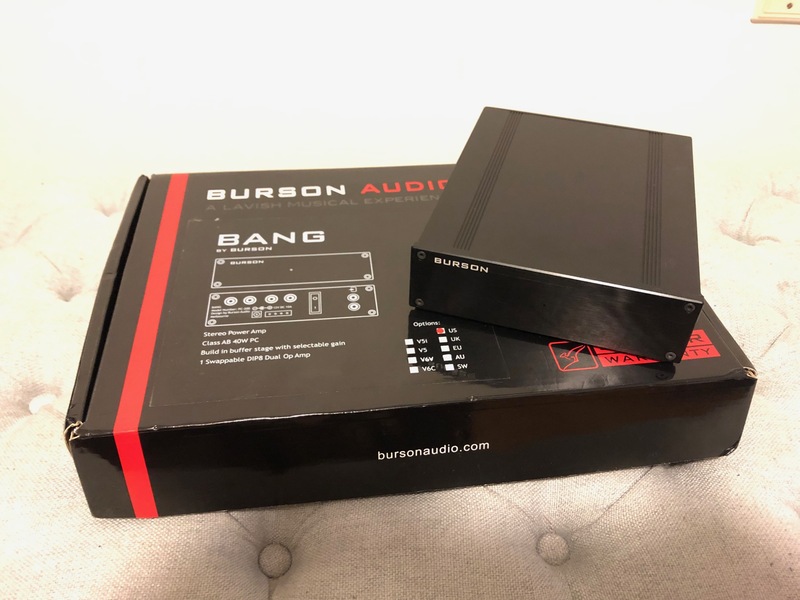 There’s plenty of reviews which go into a hell of a lot of technical details on the amp - I’m afraid I don’t have the same level of technical knowledge but I do know what sounds good - and the Burson Bang certainly offers one hell of a bang. Loud! LOUD. Super duper bloody loud. I used to have the Sony set to around 60 - 70% when I wanted to listen to music loud. And believe me, Sony’s version of loud is not the same as Burson’s. To be honest, with the current setup of Google Chromecast Audio, Burson Cable + interconnect, Burson Bang and Mission bookshelf loudspeakers, I dare not set the volume above 10%. After listening to a few of my favourite tracks in ‘headbanging mode’ and then re-adjusting the volume to 7% one thing became apparent straight away - the system sounds really nice when playing at lower volume - much fuller and more detailed than the Sony system. One problem I appear to be having though is that the Chromecast Audio is putting out too much signal for the amp. I changed the High Dynamic Range setting and found that the output was reduced somewhat - basically something like 16% volume is like what 10% volume was link prior to making the change. Whilst that gave me more usable volume range, I personally found the High Dynamic Range setting simply sounded more detailed. 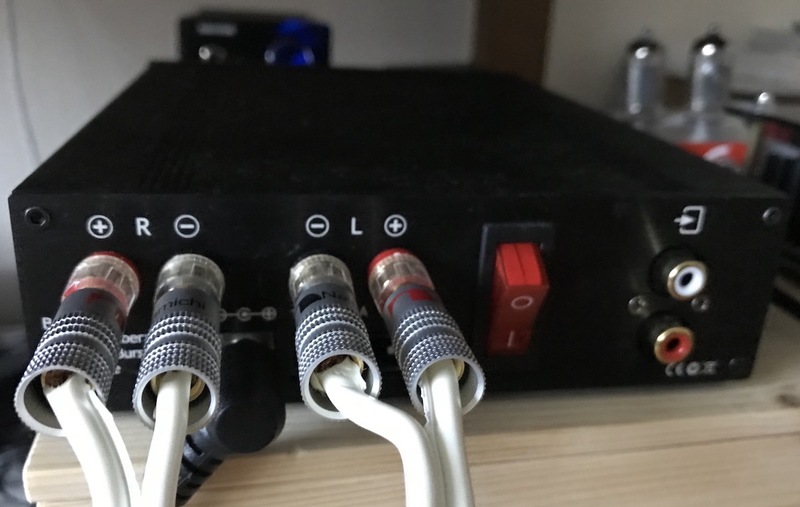 I really wanted to be able to use the Chromecast Audio directly into the amp - firstly to keep the audio chain as clean as possible and secondly to save money. I shall continue to experiment. What this amp does offer you though is superb sound quality and a stability to the sound which is simply missing when using lesser components. The soundstage stability is truly remarkable. You can focus your mind on one specific element of the recording and easily discern it from the rest of the mix. It’s not just the rock solid imagery that this amp conveys - the timbre of the instruments and voices are also quite wonderfully rendered. I must be honest here - I’ve always considered amplification to be a somewhat simple task - take the signal and make it louder without adding or taking away anything from the source. Whilst this is an absolute truth still as far as I’m concerned, the Burson Bang is producing texture and detail to my music in a very positive and enjoyable way. Each time I listen to the system now I find something new in familiar recordings. The overall frequency of the amp appears to be pretty neutral in my opinion - any colouration in the sound is simply a result of the improved and wonderfully controlled dynamics. What I realised today when listening to the system is that there’s a bigger sense of scale - listening to some comparatively simple music such as Patricia Barber - it truly was like she was stood up singing in my room - right in front of me! Very cool. Bass is deep but controlled. My loudspeakers are of reasonable quality and this amp certainly makes them shine. Mids are rock solid and offer a really nice soundstage. Treble is sweet and nicely controlled. Music through this system never becomes ‘shouty’ or fatiguing. I think the keywords for the sound quality from this amp has to be “rock solid”. This amp makes me want to consider repositioning my speakers in order to improve the sound even more - unfortunately I’m very constrained with where else I can put them. Ah well! One final note regarding the Burson Bang - there’s the slightest noise comes through my speakers when I switch on the unit. The noise floor is non-existent without music being played and the only clue that the amp is on is the extremely bright blue LED on the front of the unit. Something that’s going to be mostly covered with Bluetac or black tape in very short order. Even when I was using the Sony system (which featured remote control volume control) I used the Google Home Mini to control much of my listening using voice commands. This works really well and I often start a listening session without actually having to touch anything. Whilst this is very cool and Star Trek like, I often find that I have great difficulty in deciding what I want to listen to and can’t verbalise it effectively. I end up reaching for my phone or tablet in order to select some music to listen to. This, I suspect, is very much a personal thing and perhaps will fade once I become more used to living in the future. There’s something about being able to use your voice for controlling pretty much all aspects of music listening. Tweak the volume in 1% steps, quickly skip tracks, mute/pause the music and even change source (kinda) by jumping from Google Play Music to internet radio for example. It’s not perfect but it’s getting very close. In my opinion, Hi-Fi is very much regressing. The quality of the source material is generally getting lower and lower (although in all fairness you can now access very high resolution music if you’re prepared to pay for it). Although I’m more than happy with the sound quality generated by the Chomecast Audio, I am fully aware that there are alternatives out there which sound a lot better - but at greater cost - both in terms of storage space and finances. 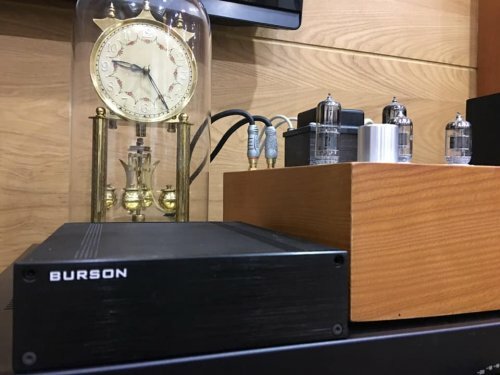 I personally recognise that, partially because of the limitations of my hifi system and partially because of my age, I’m no longer ‘chasing the dragon’ of extracting the maximum signal from my sources - I’m more interested in tone, dynamics and impact - something that the Burson Bang delivers in bucketloads. The Chromecast Audio is an excellent streaming device in my opinion. It’s integration with the Google Home is brilliant, the sound quality is more than acceptable in my opinion, there’s no noise floor that I can hear from the Chromecast itself and its overall concept is stunningly well executed in my opinion. What the Burson Bang does for me is transform a mid-fi casual listening system into something far more analytical and enjoyable. The size of the amp is ideal for me and I’m toying with the idea of hiding the system away and just having the speakers visible - that should please the wife somewhat. In conclusion, I rate the Burson Bang very highly indeed. It’s a very well made product that just gets the job done with no bells and whistles. It’s fair to say that the amp is aimed at purists who need to get the best sound quality out of their system without having to compromise on size. Well done Burson - an absolute winner! As I was copying and pasting this review from my word processor I thought I would add a couple of thoughts that have come to me since I wrote the review a few days ago. The Burson Bang screams quality to me. The cables they thoughtfully include with the package are really nice - I kinda forgot to mention this. Also, I forgot to mention the fact that you can change the op-amps in the device which can potentially improve the sound even more. Interestingly Burson actually supply a tool to get the screws out in order to do this upgrade yourself. To paraphrase Paul Hogan (note Austrailian note here) "That's not an amp - THIS is an AMP!!!). Sorry Burson for the stereotyping - hope you didn't spill your lager on the roo over that one. Disclaimer: The Burson Bang and Fun sent to me are samples units in exchange for our honest opinion. I thank the team at Burson for giving me this opportunity. My setup for this review is the Burson Fun (Headphone Amp/Pre-Amp), Burson Bang (Speaker Amp), Burson Conductor Air (DAC), Hifiman HE-Adapter, Shiit Loki EQ, iPad Pro, Tidal, Hifiman HE6se amd Hifiman Susvara. The Burson Bang came in similar packaging as the Burson Fun. 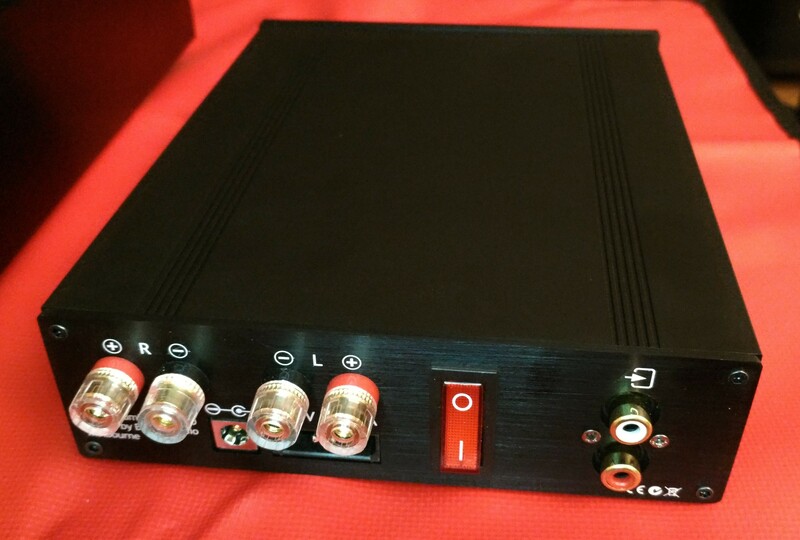 All black pressboard box with the details of the amp on the top cover with the choice of selected op-amp highlighted. Inside the box the amp itself is in enclosed foam in the center of the box with the accessory box to the right and the power supply to the left. The layout is very clean and the amp is well protected for shipping purposes. Inside the accessory box you get a set of RCA interconnects, an allen wrench for removing the top cover to exchange op-amps, and a warranty card. 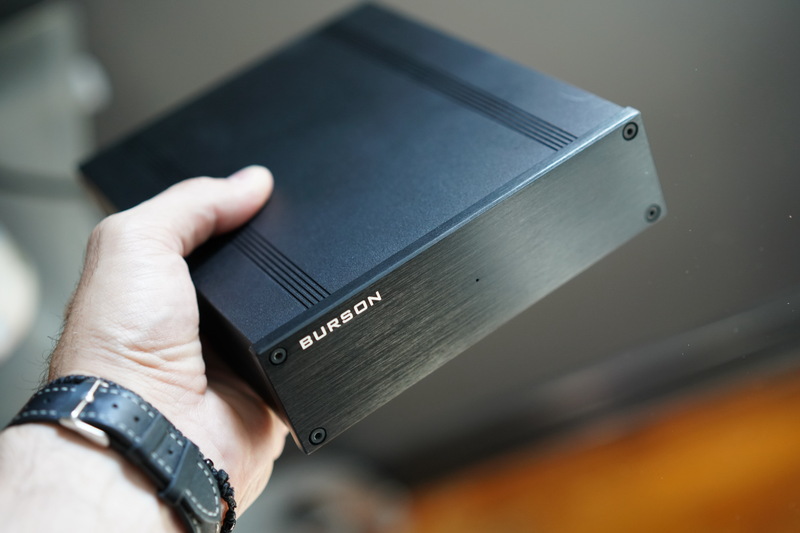 Just like the Burson Fun, the Burson Bang comes in a black anodized aluminum case. The Burson Fun and Burson Bang are perfectly matched in size and sit atop each without any issue. The Burson Bang lacks any controls on its front panel. You do get a blue led light to indicate that the Bang is powered on. The rear panel (going from left to right) are the output binding posts over the external power jack and molex connector for PC power. Just to right of center you have the power switch. To the far right you have the RCA inputs. To get to inside of the Bang, use the supplied allen wrench and unscrew the top two upper set of screws on the front and rear. Once you get the lid off and you flip it over, you’ll be greeted with a diagram the details the component position and layout. One thing to note on the diagram is the location of the op-amp. This is very useful when op-amp rolling. 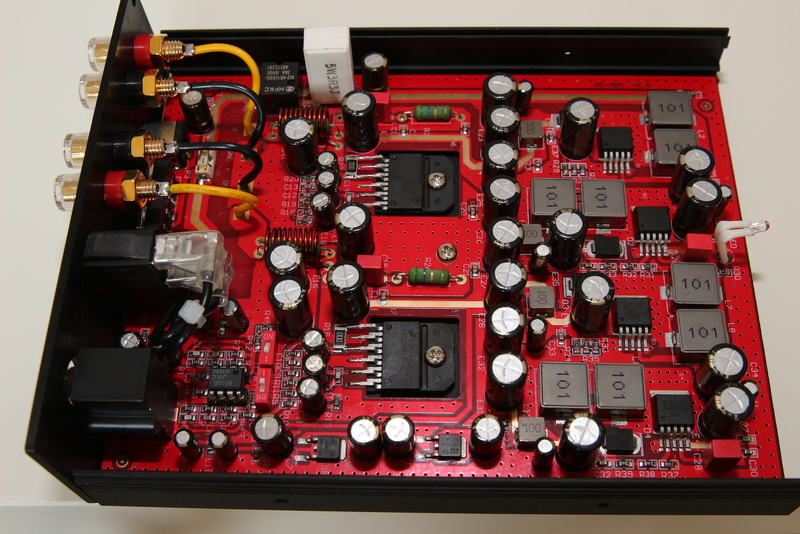 The Bang use one dual op-amp that is shared by both channels. In theory the use of a dual op-amp should help with mismatch or channel imbalances. My unit came with the stock NE5532 op-amp. Burson does offer the V6 Classic and V6 Vivid op-amps for rolling. 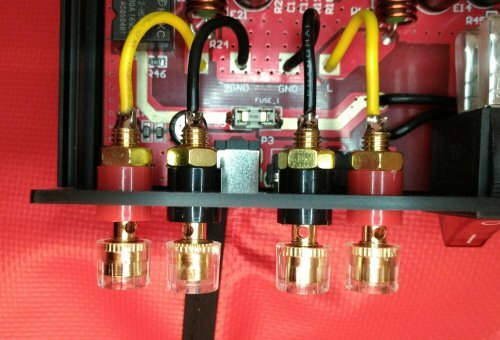 But the Bang should be compatible with other op-amps have a similar pin configuration. Burson encourages op-amp rolling and you don’t void the warranty by doing so. 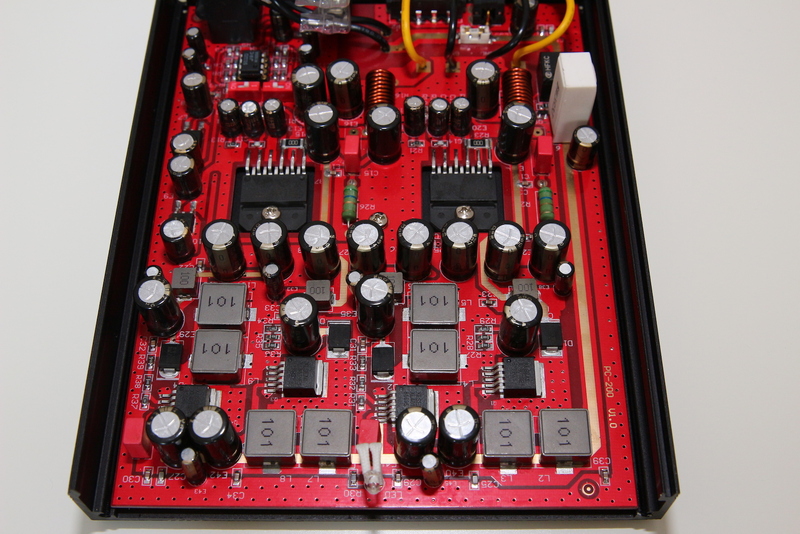 The Bang uses 4 distinct MCPS circuits to feed the Class A/B dual mono circuitry. 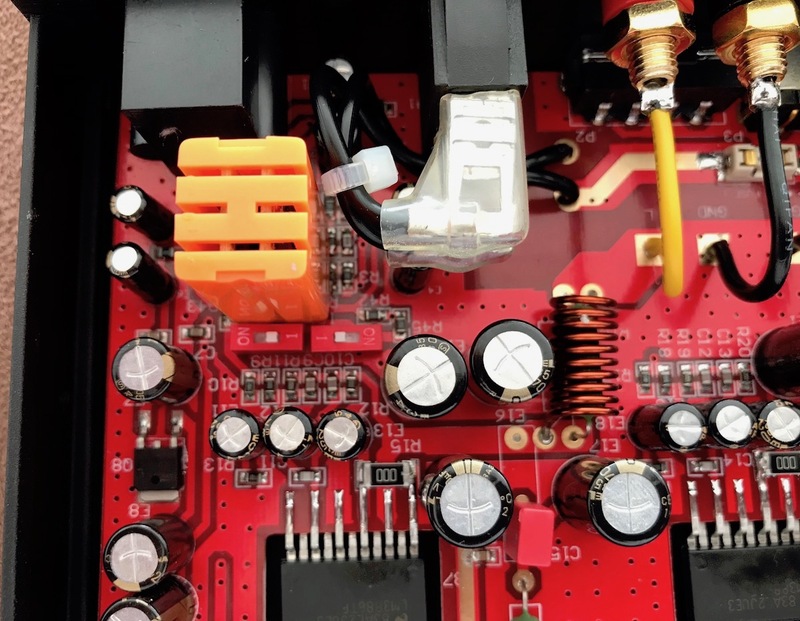 You can also see the usage of the high performance ELNA aluminum electrolytic capacitors and Vishay resistors throughout the design. The Bang also offers the buffer of the Cable+ system to allow for adjustment of input impedance to match your source. This is especially critical since the Bang relies on the pre-amp for volume control. The cool thing about the Bang is the internal gain buffer stage has selectable impedance levels. This will come in handy when using portable products with low impedances or high-performance pre-amps. The Bang offers tons of versatility and should integrate into easily into any system giving you perfect performance and volume control regardless of equipment being used. Using the stock op-amps with the HE6se’s all I can say wow. The Bang sounds big and bold. The soundstage is wide and the tone is so natural. It sounds so much bigger and powerful than its size. The frequency response sounds linear to my ears. I can’t detect any emphasis to bass, mids, or treble. To me the Bang, like with all of the Burson products, gets the midrange spot on. It’s warm, immersive, has tons of character, and is very musical. The treble is clear and energetic. It doesn’t sound edgy or abrasive but remains crispy and detailed with tons of clarity. The bass is authoritive with good decay and rumble. The drivers on the HE6se’s are in total control when driven by the Bang. The bass on the HE6se doesn’t sound loose or boomy. Instead sounds fast and impactful. The midrange is alive and there’s no sibilance in the treble due to the warm nature of this amp. 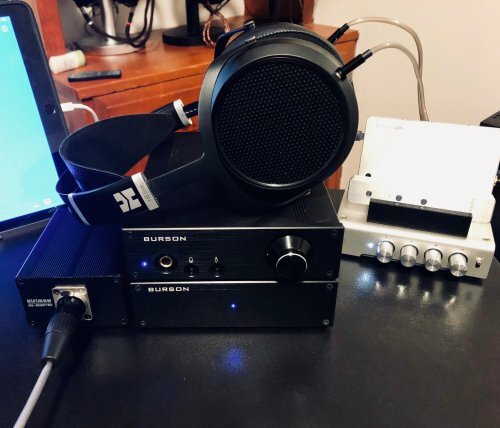 I love the Burson Fun and Bang pairing with the HE6se’s. a hint of muddiness, the instruments never sound crowded. In fact, the imaging is great, the dynamics are superb, and the Susvara’s are holographic. I have the Burson Timekeeper on hand. It’s been what I use to drive my Susvara’s, HE6se’s and the Abyss Phi’s when I had. The Timekeeper is 3x’a the cost of the Bang. It’s also 80 watts into 8 ohms compared to the 29 watts of the Bang. I didn’t expect the Bang to compete with the Timekeeper and I was correct in my assumptions. The Timekeeper is more open sounding, has better timbre and instrument separation, it’s even more cleaner sounding, is more transparent, has the betters resolution, and has a dead quiet background. Timekeeper and Bang are definitely from the same family of amps. The tone is similar, but dynamic range is greater on the Timekeeper. The Timekeeper is like the Bang but on Steroids. Everything is just sounds bigger on the Timekeeper. It’s a heck of amp. You can bridge the Timekeeper and get 240 watts out it. With all of the said the Bang is warmer sounding and has a musicality about it the is a more enjoyable listen. The Timekeeper is way overkill for any headphone but it’s better than headphone amp I’ve heard. The Bang fits the bill perfectly it’s 29 watts of power on tap can drive any headphone on the market today. Either directly from the speaker taps or using by using Hifiman’s HE-Adapter. I have no problems recommending the Fun and Bang as headphone system to drive every headphone out there. The warm nature of the Bang adds musicality to all my headphones. Together you have all the power, a wide soundstage, great detail and clarity, a beautiful, natural tone, an amp where every note is heard, and not a single micro-detail gets missed. I have no trouble recommending the Bang for driving speakers and in my case headphones. Disclaimer: The Bang is a sample unit sent from Burson in exchange for my honest opinion while the Play is from Burson’s review tour. 2018 was an interesting year for Burson. From a manufacturer of what can be described as “boutique” (and expensive) audio equipment, in a few months they managed to unleashe 5 (yeah, five) affordable products: Play, Fun, Bang, Playmate and Swing. While they all shares many similarities, the Bang perhaps stands out the most: it were made for speakers, and it has no controls. Despite being a power amp for speakers, the Bang shares the exact same chassis as its brothers: the same size as a DVD-RW drive of old. The design language can be said to be “industrially minimalistic”, as with the others, there’s nothing on the black matte body except for a few lines that keep it from being too boring. In terms of looks, the Bang is the exact opposite of my other power amps. Whether it’s Denon or Marantz or Panasonic, you can always count on my amps to have at least 10 pots/buttons/switches for bass/treble, input, balance etc. The Bang has nothing but a small LED to indicate whether it’s on or off. Yeah, no volume knob either. While this strange design will definitely deter some people (more on that later), the tiny footprint is definitely a huge plus. We have 3-4 power amps in the house, and as each weighting up to 20kg (~45 pounds), carrying them around poses serious risks of injury. To make it worse, every year we’d have to take them to the shop to do some clean-up. The Bang’s weight? Around 2 kg (4.5 lbs), meaning it won’t be a problem even for 5th graders. The power brick is quite large too, but even then it’s still much more transportable than any speaker amps I’ve ever seen, including those for bookshelves. And because it’s so small, it helps a lot in de-cluttering my listening corner. 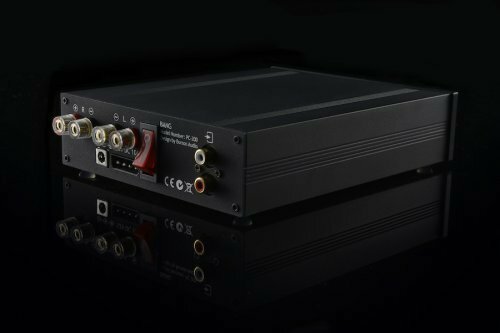 Without any control on the front plate, the Bang isn’t designed to work directly with a “pure” DAC – you need a preamp in between. 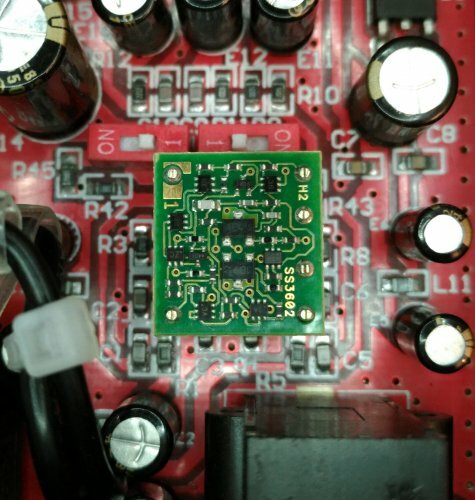 This applies to CD players, NAS, DAP and any devices that output constant 2V signal. Thankfully you can easily find a great DAC that has amp built-in: Chord Hugo, Grace Design M9xx, Audioquest Dragonfly, LH Labs Geek Out... DAPs like the Hiby R3 or Pioneer XDR-100R also make for perfect pairing. 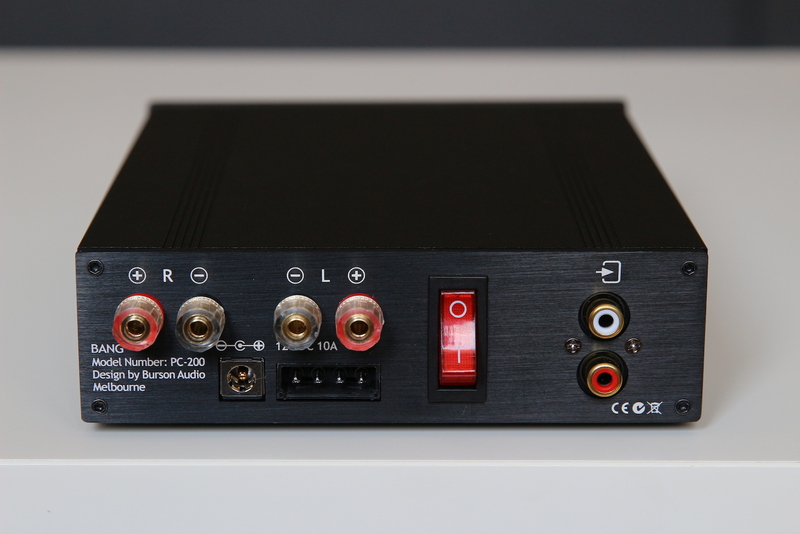 Lastly, if you already have a great DAC that cannot output variable volumes, accessible buffers/amps like FX-Audio Tube-01 or JDS's Objective 2 are all you need. 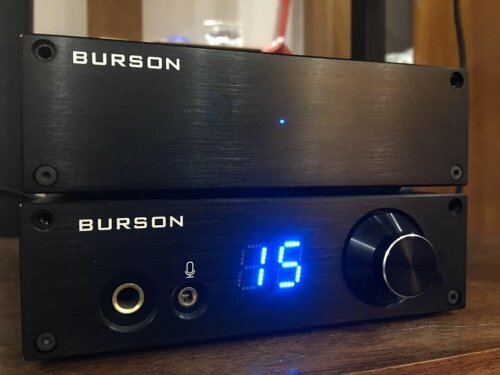 But Burson's intention can't be mistaken here: I would like to think they designed the Bang specifically as an add-on device for the other products in the same Desktop line: the Play (DAC + head-amp/pre-amp outputs), the Playmate (same as the Play) and the Swing (DAC + preamp). All of Burson’s Desktop Series share the same chassis, and they look great when stacked. Most importantly, the Play (V5i version and up), the Playmate and the Swing all come with a remote control. 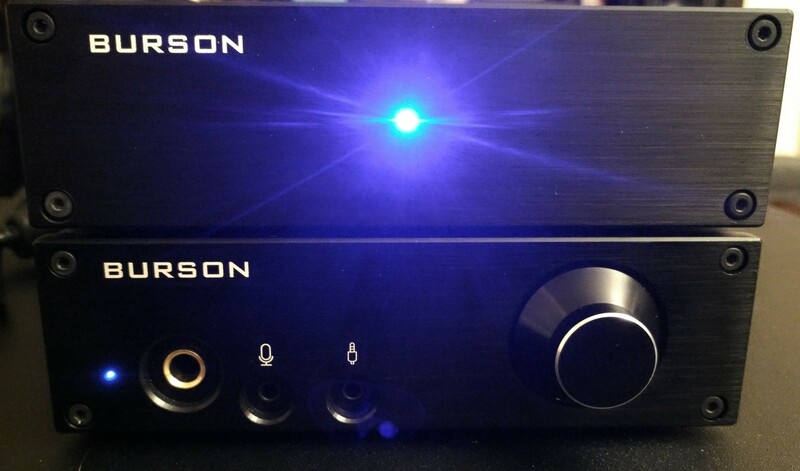 To quote a fellow head-fier, this makes the Burson DAC/pre-amps pair with the DAC like "yin and yang". Having spent so many years not being able to control the volume or mute the music from a far, I just have to give Burson a huge plus on this one. Speaking of volume, the Bang is loud. 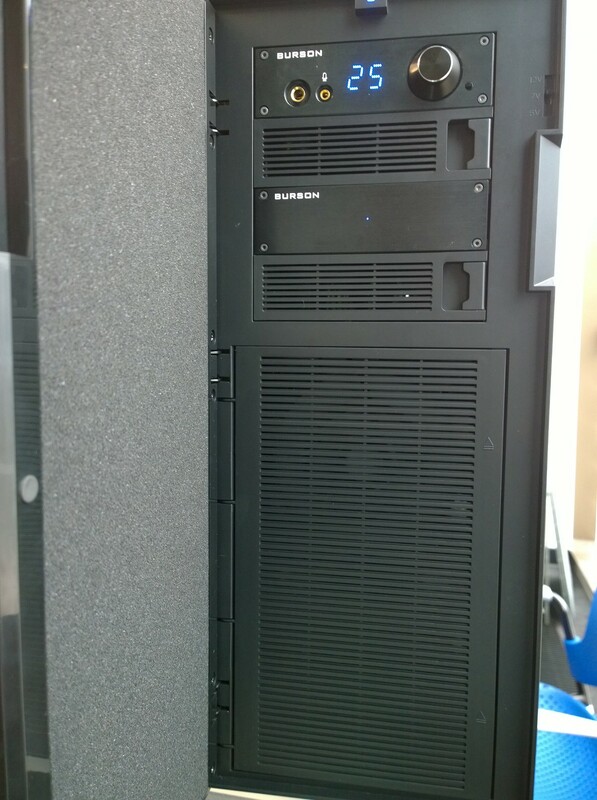 I had thought that it would only have the power to drive my Panasonic bookshelves, but that didn’t turn out to be the case: using Burson’s Play as the source, I was basically operating from 1 to 10 – the max volume level of the Play is 99. Similarly, I never went past 25 on my Dragonfly, or 6 o’ clock on my Little Dot mk4 + Modi Multibit. This reminds me a lot of Burson’s seemingly discontinued Cable Pro+ products: install the cable and amps that normally need to be set to 9 would be loud enough at 3. 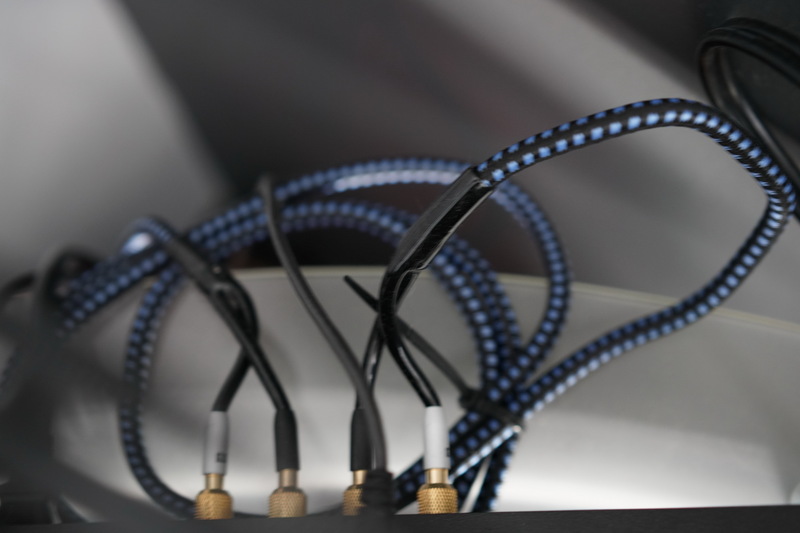 The dynamics is different with the Bang (you control the volume from the pre-amp, not the amp), but the it does contain the same Impedance Matching technology first found on the Cable Pro+. Also, no matter what (small) volume I set it at, this Impedance Matching technology made sure I'd never experienced channel imbalance. I did accidentally start playing when the Play was set at 45 (around 2VRMS, per this thread’s measurement), and to my surprise, my ears are still working. It wasn’t a pleasant experience, but it didn’t cause any pains or panic attack. Once again, I think it has something to do with the Impedance Matching technology. For me personally, headphones and speakers have served somewhat opposite roles, where headphones are more analytical and speakers are mainly for “enjoyable” experiences in my free time. It should be noted that in my country (Vietnam), a lot – if not the majority – of home audio equipment are vintage or well-used imports from Japan, US or Europe. Both my Denon PMA-780D and Marantz PM-50 seems to be older than me. They barely ever try to be realistic, with the Marantz slowing all the songs down and the Denon V-shape-izes everything it touches. In this context, it’s easy to explain why the Burson Bang was a pleasant addition: it brings the speakers much closer to their “root” sound. Using the Bang to drive my KG4 resulted in a more nuanced and detailed Vocal experiences, especially on more acoustic tracks. This was the first time that I can hear singers taking their breath on my speakers; changes in pitch can be discerned easily and long notes no longer feel slightly autotune-y as before. Trebles seem to roll off at the right moment, smooth enough for piano and biting enough for guitar solos. The bass is more articulate than doesn’t artificially inflate any sub-frequencies. If other amps are made for excesses, the Bang seems to be made with balance in mind. As such, transition always feel clean and there was never a moment where the lower frequencies intrude upon mid-ranges or trebles over-stay their welcome. If anything, the speakers did move closer to my HD6xx in terms of realism, which were very welcome for Classical, Rock and Pop music. Because the Bang pretty much leaves the sound signature to the speakers and to a lesser extent the DAC feeding it, synergy (or lack thereof) was never a problem on any speakers in the house: Klipsch KG4, Klipsch KG3.5, JBL XE-05 and a pair of Tannoy towers. This would be a very important advantage, as I did have to shell out extra $$$ for the Marantz after finding out that Denon + KG4 sounds horrible while Denon + KG3.5 is perfectly fine. Though the Bang isn’t perfect for all use cases (I did find myself wanting more mid-bass for EDM), its coherence makes it the most versatile amp I’ve ever used. On the other hand, there were times where the Bang produce a soundsig that is too “clinical” for my liking, for example when it’s paired with iFi’s iDAC2, using Burson’s Fun with V6 classic op-amps as preamp and volume control. On the other hands, the Bang is a good combination with Aune S16 or Schiit Modi Multibit and Burson’s own Play (V6 Vivid and V5 op-amps installed in the dual slots). The Bang has its own dual, DIP8 op-amp slot as well, but while I found swapping op-amp to be more effective here than on the Burson Fun, in the end it’s not as noticeable as on the Play's I/V and LPF slots. My sweet spot was the MUSES 8920, which is a bit less “dry” than the stock NME. The more expensive Burson V6 Classic did smooth out the sound a bit more, but I did not feel that the upgrade was necessary. Additional tuning can be achieved via tube buffers or other types of pre-amps as well. Here the Bang once again outshines my Denon and Marantz - “transparent + colored” should easily trump “colored + colored”. 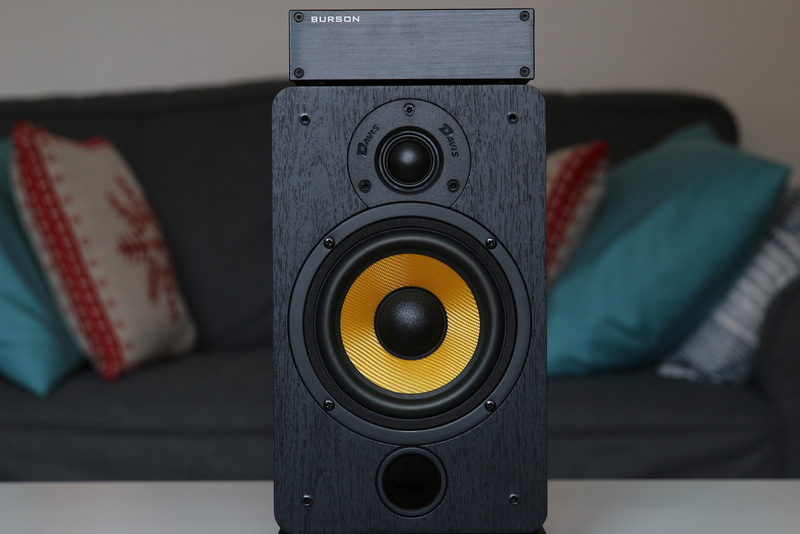 The Bang has its drawbacks and its strengths, but overall Burson seems to have a very specific purpose in mind: make a product for computer-based head-fiers to “expand” their listening experience into loudspeakers as well. The Bang doesn’t even have a volume pot, and it only comes with a 2 RCA-ports, no more. Its only advantage is a tiny footprint and a transparent, musical sound. And that is why it shines. If you are reading this - a review on head-fi.org, you most likely own a quality DAC/amp or a great DAP. Add the Bang and a pair of Klipsch, boom, your game now include hi-fi speakers as well. Great review! 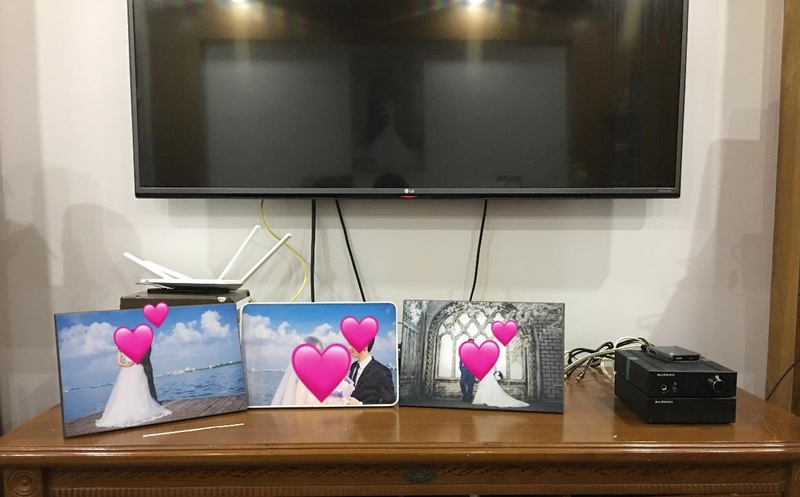 But wedding pictures on top of audiophile gear? Now I do hope my wife will never see this review! I always told her that wedding pics should stay away of my Hi-Fi equipment (colours may fade out from the bass). Small things, but with great impact, like the BANG. Pros - 1. Solid metal exterior construction. 2. Sound after the initial "pop" or "screech" is full and detailed. Cons - 1. This is the second Burson Audio product I have reviewed and both units have had issues with odd pops or sounds when operating the unit. Also, based on my review partner's experience with the same unit I don't feel confident in their quality control and am hesitant to trust my expensive speakers with their products. 2. The unit gets very warm with prolonged use. This would be fine as a desktop solution but I don't see how this would work well inside a computer. 3. Dang that blue light is bright! Full Disclosure: I was contacted by another member here with an opportunity to review the Burson Audio Fun and Bang. Initially it was an opportunity to keep a review unit after giving it a review. I wasn't looking for another desktop amp in this price range but for the price of free and an honest review I figured why not? In the end there was a miscommunication with Burson that did not allow both reviewers to keep both units. I decided to keep the Fun instead of the Bang since I listen primarily to headphones or my Dali Helicon 800's for two channel. Also, I was unable to review the Bang in conjunction with the Fun as i'm sure the designer had intended since I did not have access to both at the same time. As a result I used my Schiit Ragnarok as a preamp. Before I did this review I had planned on reviewing this unit with my Dali Helicon 800s. However, after the issues my review partner had with this unit in regards to pops and screeches I decided to pull out my Orb Audio Mod2 speakers rather than risk damaging my Dali speakers. and other songs from my playlists. 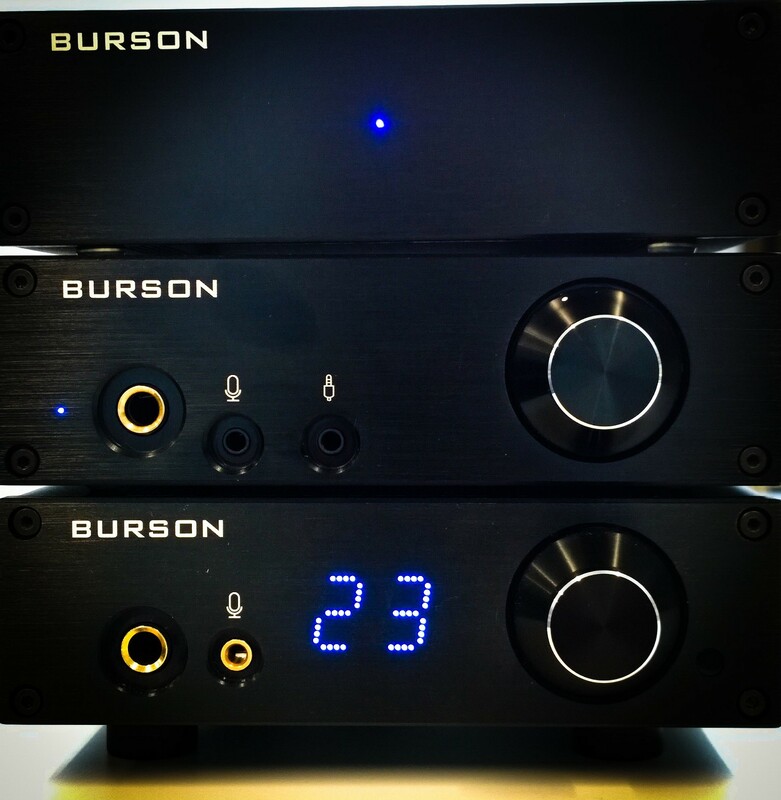 Burson Audio's line of products are made with solid metal construction that feel solid and feel like quality. The Bang feels well made and I wouldn't hesitate to stack other components on top of this unit. This unit comes with two RCA cables, a tool to remove the top to Opamp roll and a power brick. Connection wise it has two RCA inputs and a set of stereo speaker inputs. It also comes with a 4-pin Molex connector which would allow you to use it inside an open bay in your desktop. In my listening tests I used the Schiit Bifrost multibit and Schiit Ragnarok as a preamp. Upon first turning the unit on with my speakers attached I did hear the "pop" that my review partner warned me about but after that I heard no additional questionable sounds. The sound from my speakers were well controlled within the speakers reproducible range. I did not hear any distortions at low or reference levels. In comparison to the Schiit Vidar the transients weren't as quick and the sound wasn't as full. At lower listening volumes the Vidar was able to produce a wider range of sound than the Bang at volume adjusted levels. However, even though the price of the Vidar is comparable to the Bang, the Vidar is about 5 times the size of the Bang and has more power output. 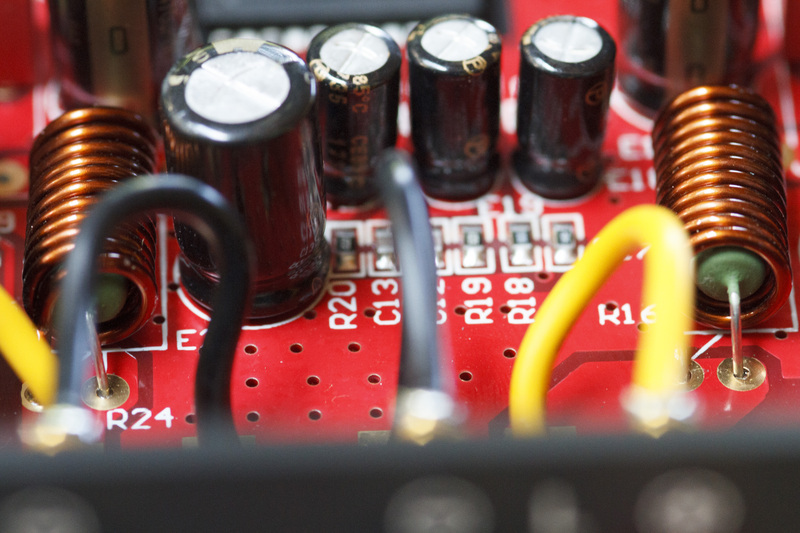 If the footprint of your amp is a concern then the Bang is definitely a great option. I also noted the unit got very warm during the review. I don't see how this would be good inside a PC case. Overall, I would say this is a good unit if staying inside the Burson Audio line. If it wasn't for the quality control issues that have plagued the Fun and the Bang that I have reviewed, I would whole heartedly recommend this line. 1. Solid metal exterior construction. 1. 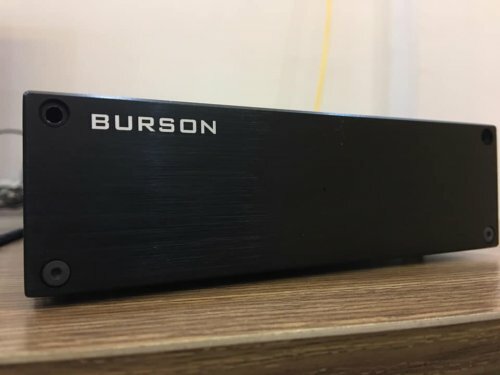 This is the second Burson Audio product I have reviewed and both units have had issues with odd pops or sounds when operating the unit. Also, based on my review partner's experience with the same unit I don't feel confident in their quality control and am hesitant to trust my expensive speakers with their products. I know about the blue LED, but you haven't seen yet the ASUS Essence One combo. BTW, I got 45C with BANG on my desk and 27C with BANG inside a very well positive-ventilated computer case: https://www.head-fi.org/threads/bur...-stereo-power-amplifier.884594/#post-14404059. Indeed, without a big and well-ventilated (positive air pressure) temps might get worse. Burson Audio reached out to me about their Fun & Bang review tour. You can find my review of the Fun here. My review partner mentioned that he would probably want to keep the Fun, and so I went into this review with the expectation of keeping the Bang. Nevertheless, this did not influence my opinion of the Bang. 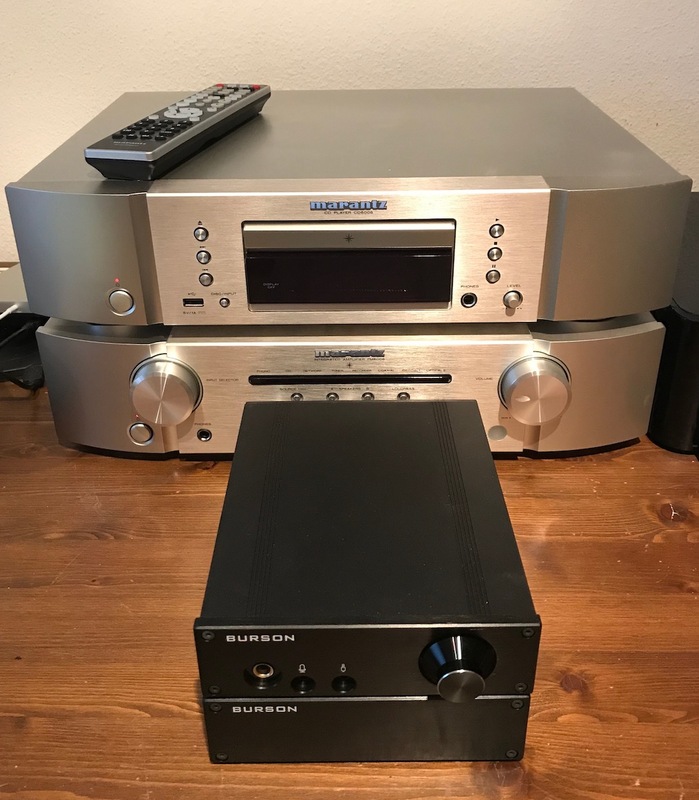 The Burson Bang in its stock configuration for $499 sounds quite nice and is definitely a big improvement over my cheap AV receiver. Swapping the stock opamp for a Sparkos SS3602 yields excellent imaging, but does not elevate the Bang in all areas. The Schiit Vidar is not that much more expensive, but sounds better than the stock Bang in every way. The Bang I received had some embarrassing build quality issues and caused some concern when being turned on repeatedly. The Burson Bang is a power amplifier for speakers with one stereo pair of RCA inputs, and two pairs of speaker binding posts to connect a pair of speakers to. It has a pretty big external power supply, but can also be powered by a 4-pin Molex connector. That's because its form factor allows mounting it inside a PC case. 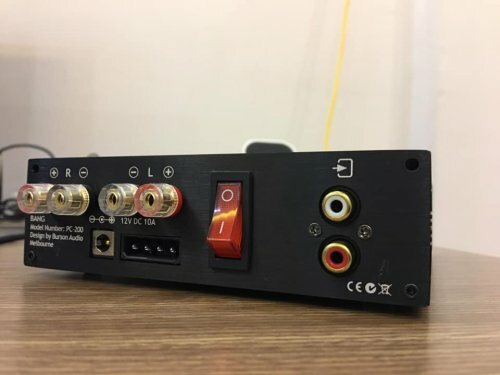 While I can see someone do that with the Burson Play (a DAC with headphone amplifier) or the Burson Fun (a headphone amplifier), it seems a bit far fetched for a speaker amplifier given the need to route four speaker wires to somewhere outside of the case. But if you want to, you can. The form factor is definitely convenient if you want to use a Play or Fun as a preamp for the Bang. The power switch is located in the back, and a blue LED on the front indicates whether the unit is powered on. That LED is in the center of the unit instead of lining up with the Fun's, appears to have a slightly different shade of blue, and is much brighter from a wider variety of angles. The Bang's power supply puts out 12 V and up to 10 amps in contrast to the Fun's 12 V and up to 6 amps, so the Bang's power supply can be used with the Fun, but not vice versa. 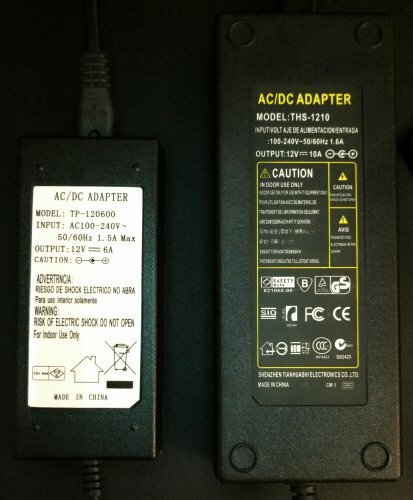 The power supplies are otherwise completely different: The Bang's DC plug is angled, the Fun's is straight, the Bang's power supply has a pretty bright blue light, the Fun's a dimmer green light, and for some reason, the two-prong plug of the Bang's power supply cable does not have the usual holes, unlike the Fun's. In terms of cable lengths, they are roughly the same, though. 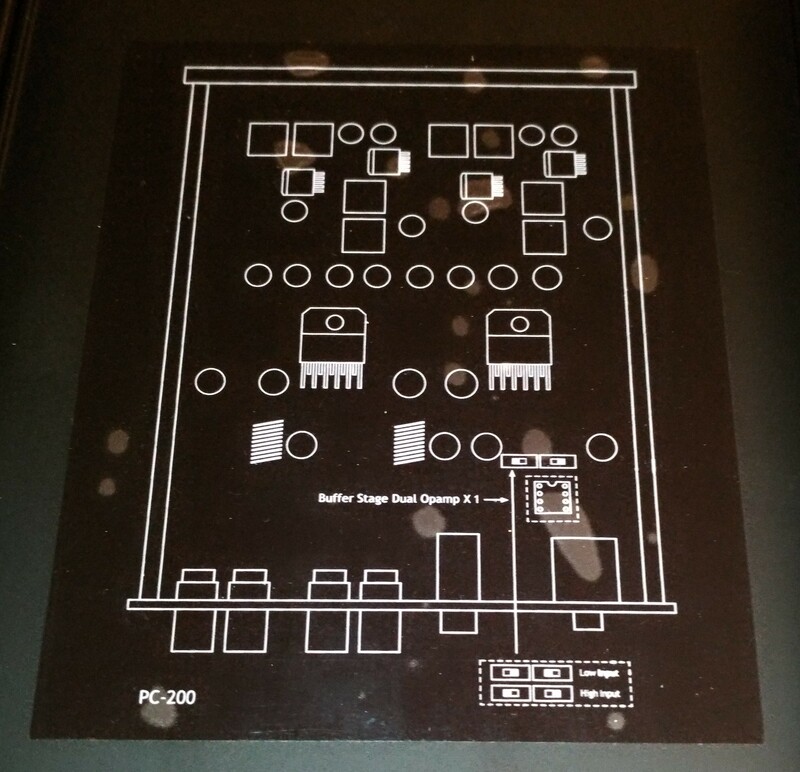 Just like with the Fun, the case's top has a sticker on the back that points out the location of the opamp. It also describes two configurations of two DIP switches on the PCB, labeled Low Input and High Input. My review unit came set to High Input. The only explanation I could find is on Burson's web site for the Bang. An image mentions a "selectable gain buffer stage". The text above it says "Bang has a built-in buffer stage with selectable impedance levels. From high-end DAC and preamps to portable players and smartphones, Bang matches perfectly with any source components, giving you the perfect performance and volume control every time." 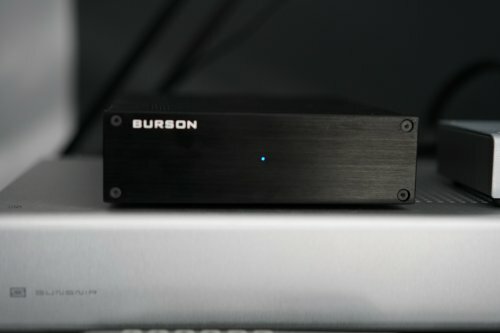 There's also a link to https://www.bursonaudio.com/impedance-matching-in-cable/, but that just redirects to Burson's home page, like apparently any other page that does not exist. I'm assuming low input is meant for non-standard sources like a phone, and high input is meant for a proper preamp. Unfortunately, the Bang did not come with a manual, nor can one be downloaded. The Bang's power supply consumes 0.8 W by itself (Fun: 0.4 W) and draws 0.02 A (Fun: < 0.01 A). When the Bang is on, but idling, it consumes about 10 W (Fun: 10 W, Vidar: 48 W) and draws about 0.15 A (Fun: 0.14 A, Vidar: 0.55 A). In use with the satellite speakers of the Yamaha NS-SP1800BL 5.1 set with the volume set pretty high, it consumed about 15 W (Fun with MrSpeakers Ether Flow: 10 W, Vidar with ELAC BS 403: 54 W) and drew about 0.25 A (Fun: 0.14 A, Vidar: 0.61 A). All figures were measured with a P4460 Kill A Watt. The package includes a pair of 2 ft long mono RCA cables, a replacement fuse and an allen wrench. That is because Burson encourages you to replace the opamp in order to change the sound to your liking - the solid state equivalent to tube rolling. I have two big issues with the Bang. One is the build quality: not only does this amp wobble quite a bit (see videos below), it's also the only audio product I have ever used that came apart when unplugging something. During initial testing of the amp I used my cheap Yamaha satellite speakers and encountered some distortion that I thought might be the result of the satellites not being able to handle a full range signal. 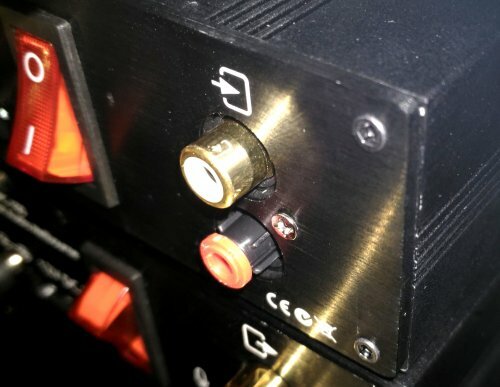 So I inserted a pair of Harrison Lab's FMOD crossovers into the RCA jacks of the Bang in order to attenuate the bass. I then realized the distortion was the result of other devices connected to the Yggdrasil, shorting their inputs when turned off, which the Yggy does not like. Having sorted that out, I wanted to resume testing without the crossovers, but when I unplugged one of them, the ground ring of one of the Bang's RCA jacks got ripped out. I was able to remove it from the crossover with pliers, and push it back in, after which it stayed put when unplugging regular RCA cables. The crossover plugs appear to have a rather strong grip, but this still should not have happened. In addition, one of the binding posts was not properly secured on the inside, which meant that loosening the binding post cap also turned the actual binding post, which is soldered to a wire on the inside. Turning the cap meant putting tension on the solder joint and twisting the wire. Not a good feeling. 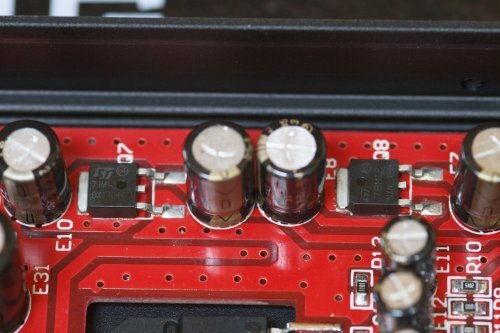 It's relatively easy to fix after opening up the amp, but not everyone will feel comfortable doing so. Even after fixing that issue, the holes in the binding posts aren't lining up straight. That probably would have caused issues for me, but "luckily" the holes are too small to accept my 12 AWG speaker cables (let alone the 10 AWG ones I normally use), so I had to use banana plugs anyway. The second big issue is that the amp is not properly muting its outputs when turning on - at least when being turned again shortly after having gotten turned off. Without speakers attached, the unit itself produces a relatively loud, nasty screech. With speakers attached, a disturbingly loud popping sound from the speakers joins the cacophony. I don't like worrying about destroying my speakers every time I turn on the amplifier. As far as I am concerned, this unit should not have made it past QC. I suppose it's nice that the amp has a variable gain stage, and the need for two switches is probably due to the Bang's dual mono design. However, locating them on the inside of the unit is extremely inconvenient. 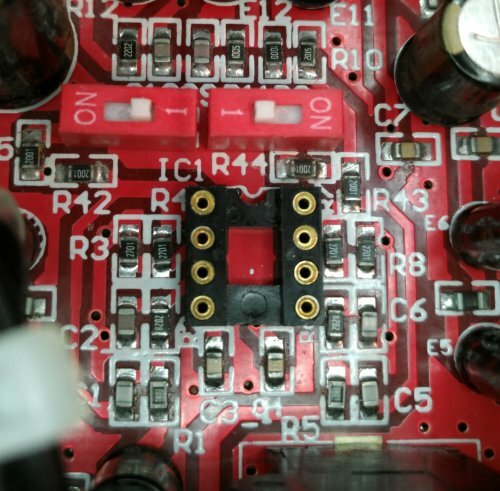 The Singxer SU-1 DDC also has DIP switches, but they are positioned on the bottom of the PCB, along with a cutout in the bottom part of the chassis. While still inconvenient, at least you wouldn't have to remove four screws to reach those switches. Luckily, most people won't really need this feature, and some of those who do won't need to reconfigure it on a regular basis. The LED is too bright, depending on the viewing angle. 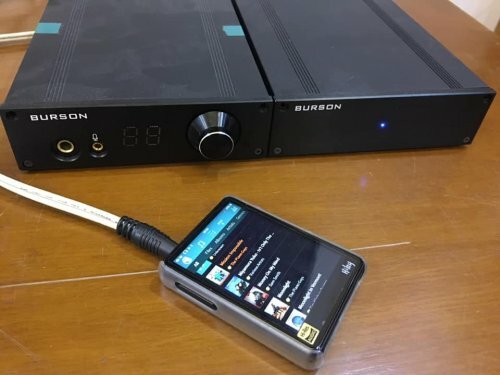 Burson is not alone with this issue, it's a well known phenomenon with Schiit's products as well. Apparently dispersing light evenly is hard. Always good to have some LightDims handy! 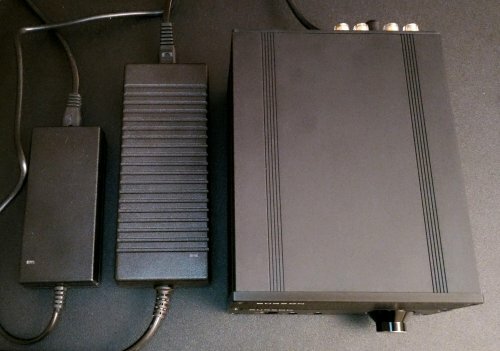 Some criticisms remain the same as with the Fun: I much prefer devices with integrated power supplies that accept regular power cords with C13 connectors. The power switch in the back feels good, but this type of switch is usually illuminated when turned on - not so here, which I find irritating. The provided allen wrench is tiny, and you have to remove two screws in the front and two in the back before you can remove the top to replace the opamp. Maybe thumb screws would have been more inviting and durable. The Bang sounds quite good for its size, even with the stock opamp. It's nice to be able to improve or customize the sound by swapping the opamp. The chassis is relatively compact and stacks well with the Fun or the Play, which makes for a neat bedroom setup. Set to 8 ohms, fronts set to large, other channels disabled, calibrated with YPAO microphone, EQ disabled, "straight mode" enabled. 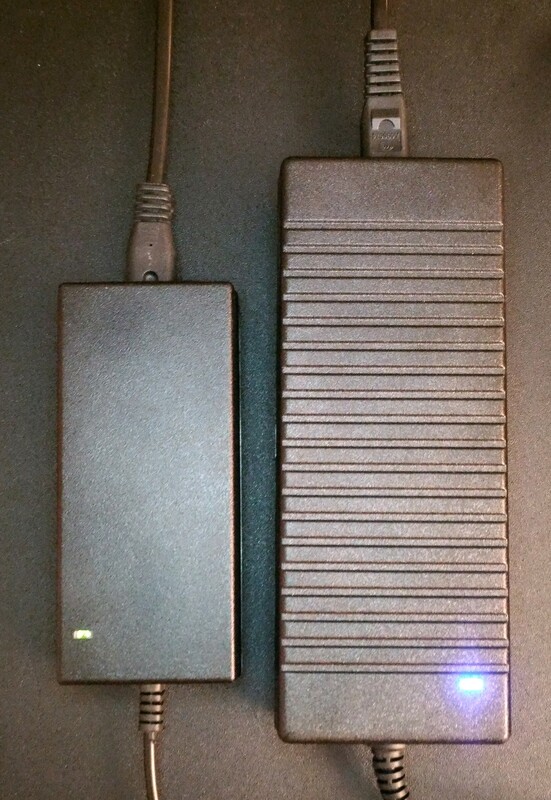 Schiit Saga in active mode. Like 2), but with the Sparkos SS3602 opamp instead of the stock NJR NJM5532D in the Bang. 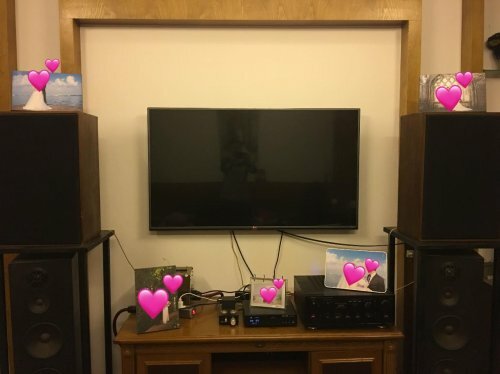 Word of caution: I normally hear these speakers with the Rythmik Audio F12G subwoofer to fill in the low end, but for this comparison I did not want to add the hassle and uncertainty of tuning the subwoofer to match each amp's gain and phase. The ELAC BS 403 are rated at 41 Hz according to IEC 268-5, which appears to be more lenient than the usual +/- 3 dB deviation allowed. I definitely recommend a subwoofer with these speakers, but they are usable without one. Still, being used to hearing them with a subwoofer means the setups will all sound lacking to some degree, compared to what I'm used to. This is actually the first time that I have used my ELAC BS 403s with this amp. When I first got the Schiit Vidar, it performed so much better with even my cheap satellite speakers that I never bothered to go back to the RX-V377 when auditioning speakers. I also didn't have the power conditioner, speaker stands, etc. at the time, nor the mighty Yggdrasil DAC, so I was curious to find out what all this extra tinkering might do to the sound. The RX-V377 pushes 2x 70 W into 8 ohms, and has an 8 ohms and a 6 ohms setting. As far as I know, the latter merely limits the amp in order to protect itself from overheating, which is unlikely to have a positive effect on the sound as long as you don't crank up the volume all the way, so I eventually set it to 8 ohms even when I was using it with satellite speakers rated at 6 ohms. The ELAC BS 403s however are rated at a nominal 4 ohms, down to 3.2 ohms at 260 Hz - not the easiest load to drive. So I was definitely worried that the RX-V377 would struggle with getting the BS 403s to a proper loudness level. Luckily, it only got pretty warm, but not exactly hot, and never shut off during testing. Note: I did not want to bother disconnecting and later reconnecting all the various other sources connected to it, which resulted in a noticeable ground loop in this arrangement. 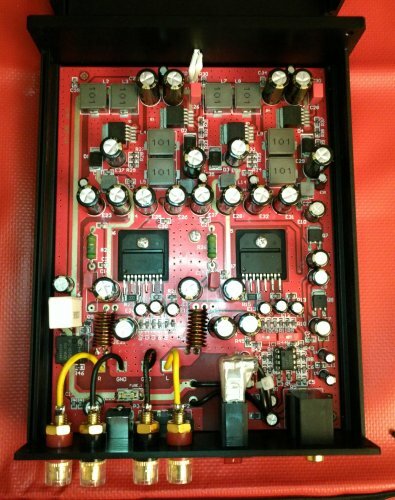 It might be possible to get better results from this amp. I was positively surprised to hear decent imaging and a well defined sound stage from a $300 5.1 AV Receiver. I have definitely heard better, though, especially apparent with Nils Lofgren's Keith Don't Go. Overall, I did not hear anything terribly offensive. On the other hand, the experience also wasn't engaging - no involuntary foot tapping, head bobbing or grinning occurred. There was some harshness or glare to the treble, some graininess to the upper mids, and a sluggishness to the bass that I did not appreciate. Yggy's ability to make instruments sound natural and real did not come to light with this amp. Clapping didn't sound right, pianos were unpleasant to listen to, female vocals were not as silky and visceral as I'm used to. I can't help but wonder whether the RX-V377's DSP is ever truly bypassed. I found myself eager to move on to the next amp after a while - this setup is a bit fatiguing. Burson describes this little power amp as a "40W PC Stereo Power Amp". 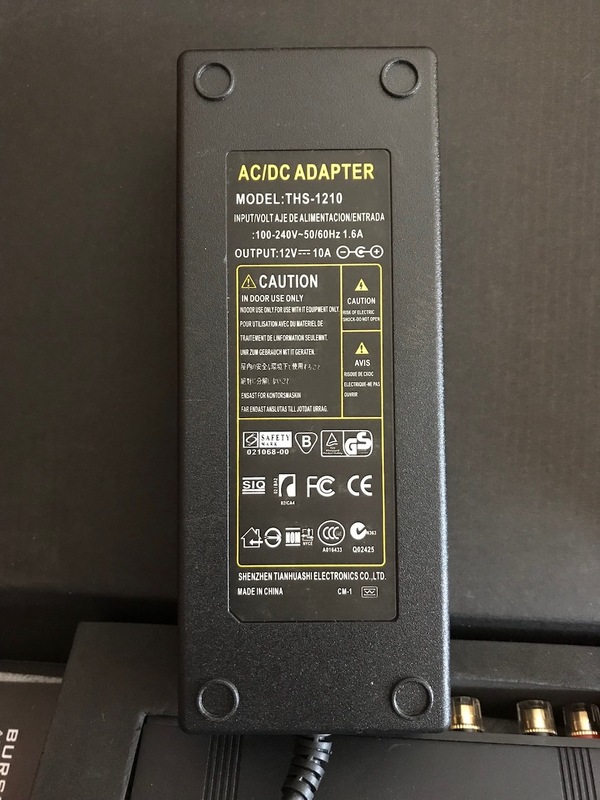 PC might mean "personal computer", because if you really wanted to mount this power amp into your computer's case, and power it from your computer's power supply, you could. Or it could mean "per channel". Either way, the stated 2x 40 W refer to a 4 ohm load where other manufacturers usually use an 8 ohm load as the standard for an amp's power rating. Into 8 ohms, the Bang is rated at 2x 29 W. Luckily my speakers are rated at 4 ohms, and the Bang's 2x 40 W are right on the low end of what ELAC recommends for them. In this setup, there was no ground loop to be heard. That may or may not be the biggest reason for the Bang's ability to reveal a lot more detail in the ambience of Amber Rubarth's Novocaine - we're off to a good start. With the stock NJM5532D opamp, the Burson Bang costs $499 - 2/3 more than the RX-V377, while also requiring a separate preamp to control the volume. AV receivers are very versatile, but Burson had the entire budget available for the comparatively simple task of amplifying a stereo pair of RCA inputs into two sets of speaker taps - nothing else. And it shows - the Bang is in a different league compared to the underfunded AV receiver tested prior. It sounds much cleaner, fuller, more pleasant. The glare is gone, the low end is on point, Yggy's realism is preserved, the imaging is more concise, cymbals shimmer appropriately and head bobbing ensues. This is nice! Not spectacular, but quite pleasant indeed. It's plenty loud with the Saga at 1pm, the Bang barely warm. Plenty of headroom left! Bang vs Vidar is a case of David vs Goliath. The Vidar has over 5x the physical volume of the Bang (not taking into account the Bang's external power brick), weighs 4x as much and delivers 2x 100 W vs. the Bang's 2x 29 W - into 8 ohms. 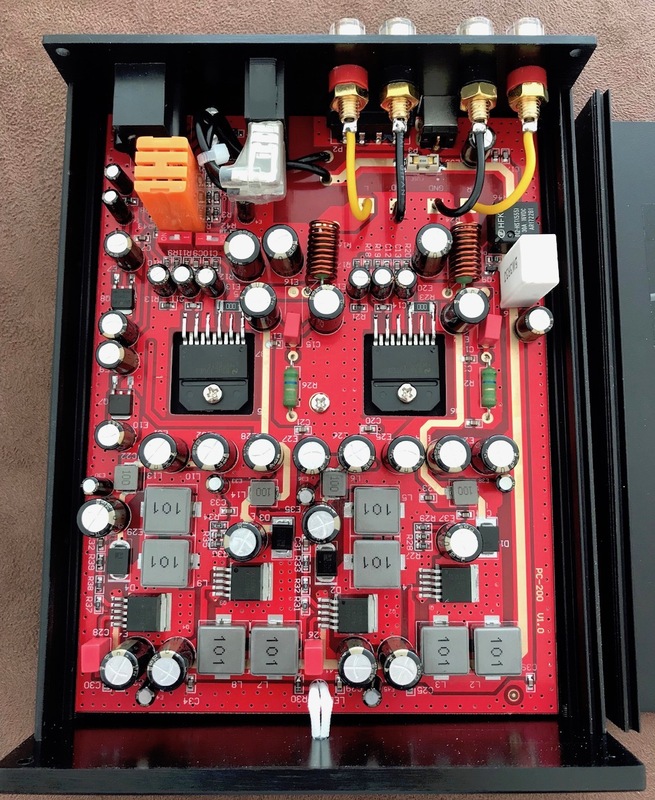 Into 4 ohms, the power rating doubles to 2x 200 W vs. the Bang's 2x 40 W. Both are single ended stereo power amps with a class A/B design, though with its additional single balanced input the Vidar can also be used as a monoblock to put even more power into just one channel. And its power supply is integrated. 4x the weight, 5x the size, 5x the power (into 4 ohms) - but at only 1.4x the cost (not taking into account tax and shipping). Is it worth it? In short: yes. Everything the Bang does well, the Vidar does noticeably better. Sharper transients, silkier voices, more focused imaging, a sound stage with depth, a livelier sound and more bass slam - all while sounding positively effortless. The Bang sounds pretty, the Vidar beautiful - definitely similar, but significantly more refined, more mature. The Vidar gets quite a bit warmer. And surprisingly, I need to push the Saga's volume a bit further to reach the same volume level as with the Bang. I still can't believe how good it sounds since I have had the Vidar for over a year now, and got the speakers not long after. But the power conditioner, speakers stands, isolation devices, the DAC in this location, the preamp - all of these are quite recent additions. And they had a profound impact that I am still getting used to. So I feel reminded of my Burson Fun review. After hearing it with just its stock opamps, I would have recommended going with the Schiit Jotunheim instead, for just a little more. 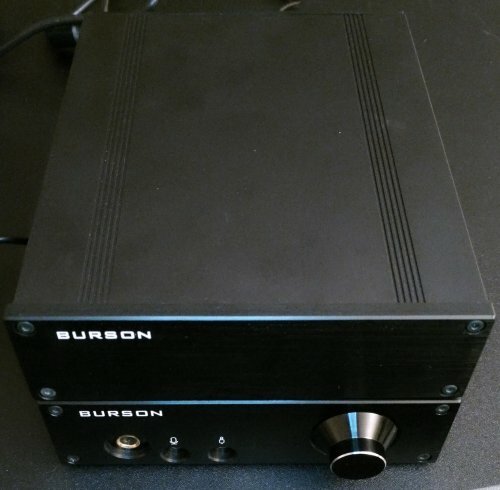 Similarly, I'd go with the Schiit Vidar over the Burson Bang with the stock opamp, assuming you have the room. But after I heard the Fun with Sparkos SS3601s opamps, everything changed. 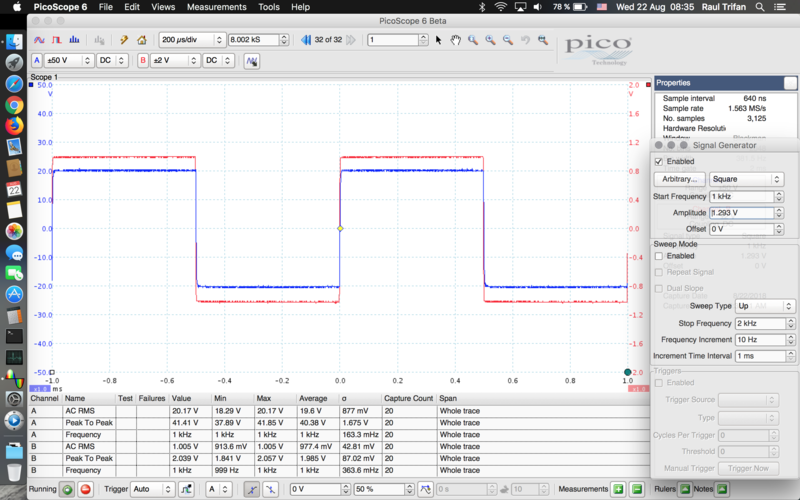 Now, while I did not like the Fun with stock opamps, I do like the Bang with its stock opamp. But who knows - will a Sparkos SS3602 tilt the balance in favor of Burson's baby yet again? Well, I have two of them in my Gustard H20. So let's do a little surgery and find out. Well! I have mixed feelings about this one. 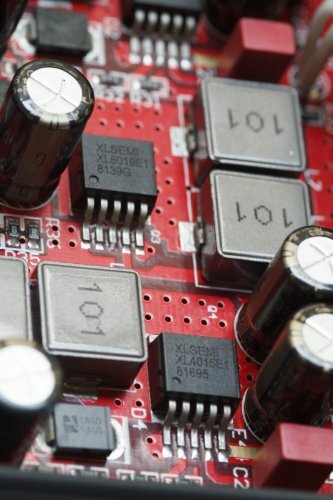 The SS3602 is a drastic improvement over the stock opamp, especially in terms of imaging. It also casts an impressively wide and tall sound stage, and seemes to provide a bit tighter bass. On the other hand the sound stage still lacks depth compared to the Vidar, and transients are still not as crisp as I would like. 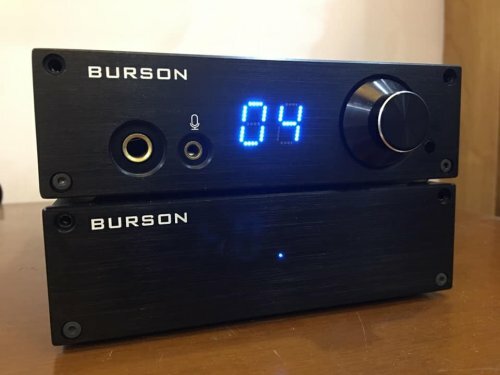 Here's my dilemma: with the stock opamp, the Burson Bang offers a decent, balanced presentation. With the Sparkos SS3602 it excels in some areas, while remaining a bit mediocre in other areas. Like a slightly burnt pizza with super fresh ingredients, there's some disappointment because it's obvious how good it could have been, as opposed to what the average next door pizza place provides: just solid pizza, neither bad nor amazing. Mind you, this is based on listening to the Bang right after enjoying the Schiit Vidar, so the memory of what could have been is still fresh. I could imagine that over time, in regular use, the experience settles to one that is simply somewhere in between the Bang with stock opamp and the Vidar. But then we're already so close to the Vidar in terms of price that I would still recommend to just go with that one if you can. 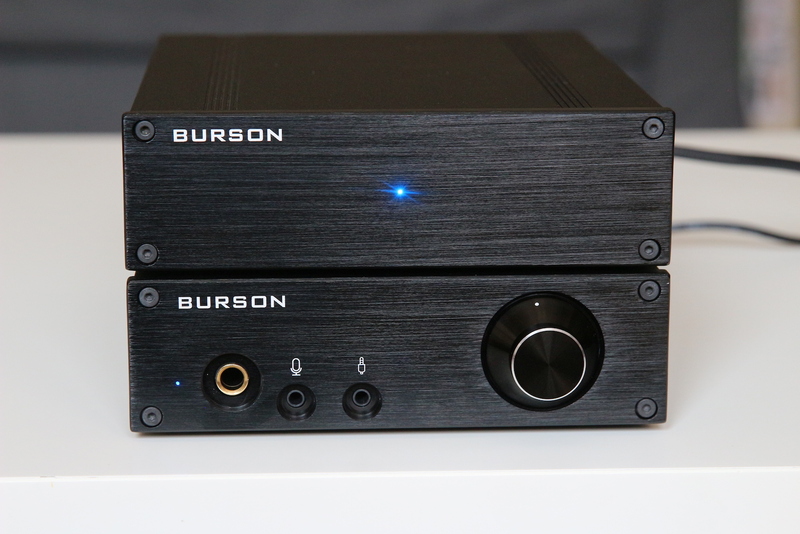 The Bang is a capable amplifier that I'll happily pair with a Burson Fun in my bedroom setup. 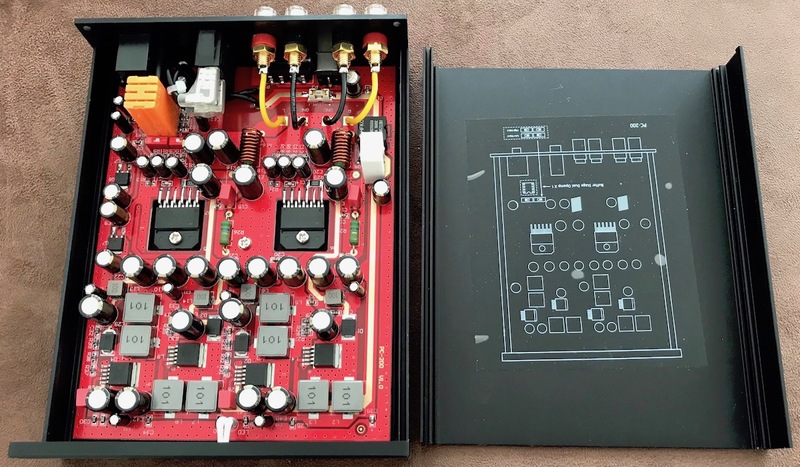 If you happen to have a good dual opamp lying around that is currently unemployed, and you catch the Bang on sale (like the 20% off Burson had during Black Friday, or the 33% off at Partsconnexion), it might be wise to go get one. Or if you're short on space. Or if you care a lot about looks and want a speaker amp to go with your existing Burson Fun, or Play, or Playmate, or Swing (can I have a Fun with a remote? Shall we call it Joy?). Outside of these constraints, however, the Bang's regular base price of $499 is already so close to the Schiit Vidar at $699 that I would heartily recommend spending a bit extra by getting the Vidar instead. 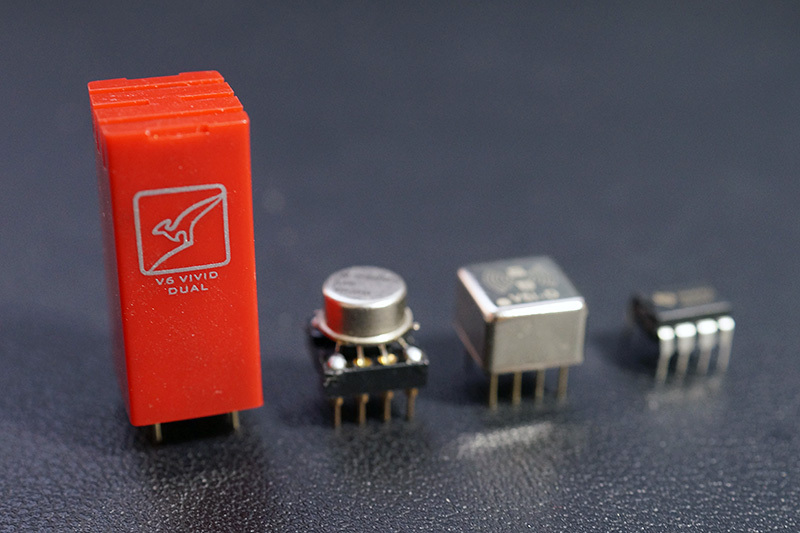 Even compared to a Bang with the Sparkos SS3602 opamp, the Vidar is a significant upgrade well worth the cost. That's a US-centric perspective not taking into account shipping and sales tax, so definitely do the math yourself. Either way, I raise an eyebrow at this bold claim on Burson's website: "Bang is like a cage fighter that loves poetry and bonsai. You will never get bored of Bang and it will knock out any challenger under $2000." No, I may actually have tested them at work first, and at home I have good power strips / power conditioners with under/overvoltage detection, and they never tripped. My Killawatt also indicates no issue, getting up to 125V, sometimes more like 110V. Also: "A few days ago our power supply supplier has contacted us, they informed us that a batched of their power supply has a defected the rush current protection the supposed to stop the power up rush current did not work. 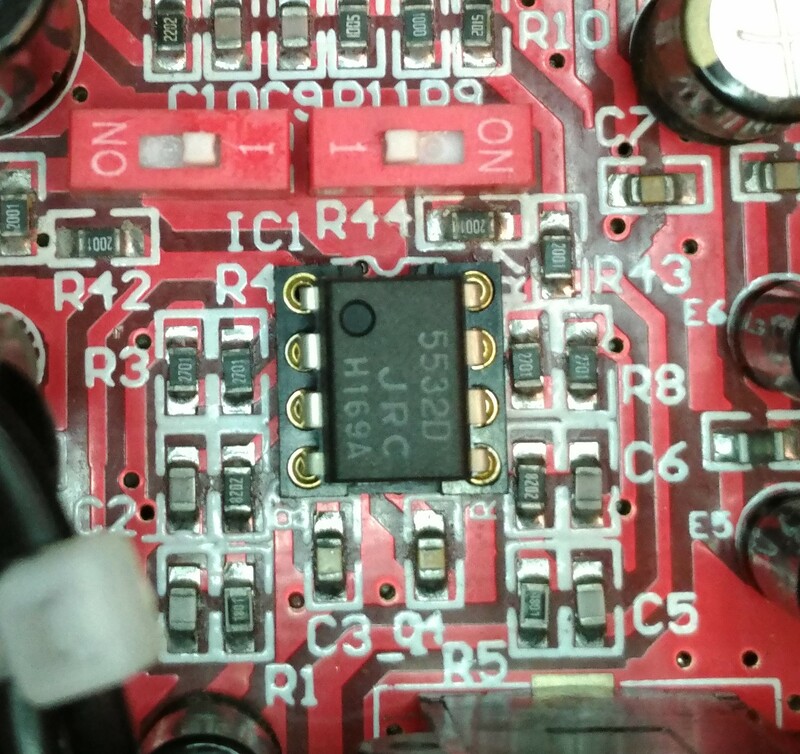 So, after we tested in our workshop we also notice that without the protective circuit our PC-100 power supply has will be damage. When you see the LED light flash that is when the PS has failed and also the same time damaged our PC-100 and hence you also hear the noise." Of course, the review unit had that buzzing issue as well, but that power supply is fine, so there's more to it than just a bad PSU. 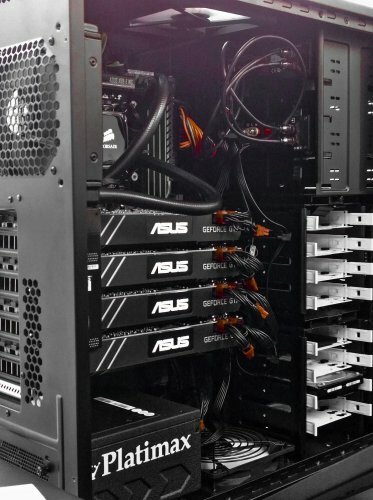 But maybe Burson has tested the PSU in that one with a defective PSU. I never got an explanation for that mystery. Burson Bang! An amplifier you can't overlook. Pros - + Loud! Can play really loud without becoming shrill or harsh. + Clean midrange with lots of detail. - Needs separate pre-amp to control volume. - Seizes if driven at it's max volume. The Burson Bang came in a black box containing the amplifier, the power supply unit, power cord, a set of RCA cables, a replacement fuse and an allen wrench to dismantle the unit if needed. I was immediately surprised by how small the amplifier is. The unit has an aluminium case, looks really sleek without unnecessary buttons or ports. Front is completely clean with a subtle LED light when it's powered on. All the connections are in the back. Has rca input and speaker cable outputs along with the power switch and a molex connector for the power supply. Opening the unit was fairly easy, all you need to do is unscrew the 4 screws (2 on each side) using the included allen wrench. Inside we can see the unit came with the stock NE5532 OPAMP. Also there is a gain switch inside that I didn't fiddle with but left it at the default "high" setting. Audio source: Spotify Premium and local FLAC files. My mainly driver is the Rega Elex-R amplifier so my feelings of the new Bang will be mainly compared to that. First thing I noticed when I switched to the bang is the volume. WOW, this thing is weirdly loud even though it's rated significantly less watts per channel compared to the Elex-R. This thing sounds really clean and there is a lot of detail! I didn't feel I was missing anything by switching from the elex-r to the bang. After I kept listening for a while I realized the channel separation felt more aparent and I could swear there was more detail in the mid range compared to my Elex. There was one way to verify all my initial thoughts, I had to switch back to the Elex-R to spot the differences. After switching back, I immediately realized that the bass and high frequencies were significantly cleaner on the Elex-R which makes sense given the price difference between the 2 amplifiers. The midrange though was pretty close, and call me crazy but the channel separation felt more aparent on the Bang. Also, playing at really high volumes the bang was less harsh and easier to listen to. I almost felt I could immediately replace my beloved Elex-R at first and save some money but now I appreciate it's value even more. The Bang really impressed me considering the price, and believe me if I didn't already have the Elex-R I would have used the bang as my main driver and thought it's the best amplifier I ve heard. 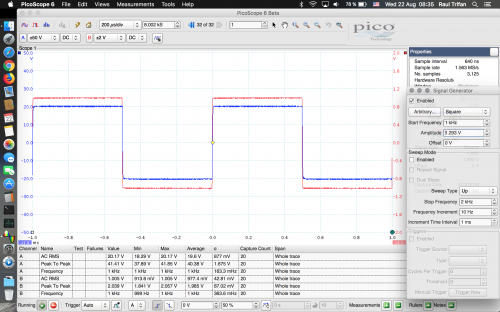 The areas where the Bang falls a bit short can definately be improved by changing the stock OPAMP to other options. 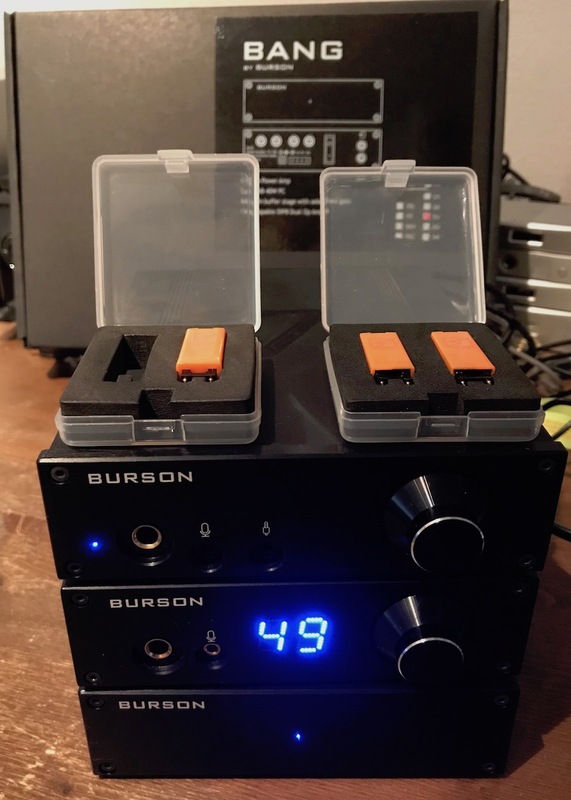 I don't currently possess any replacement opamps to include in this review but might obtain one of Burson's higher end options to try out as this little system seems extremely promising. 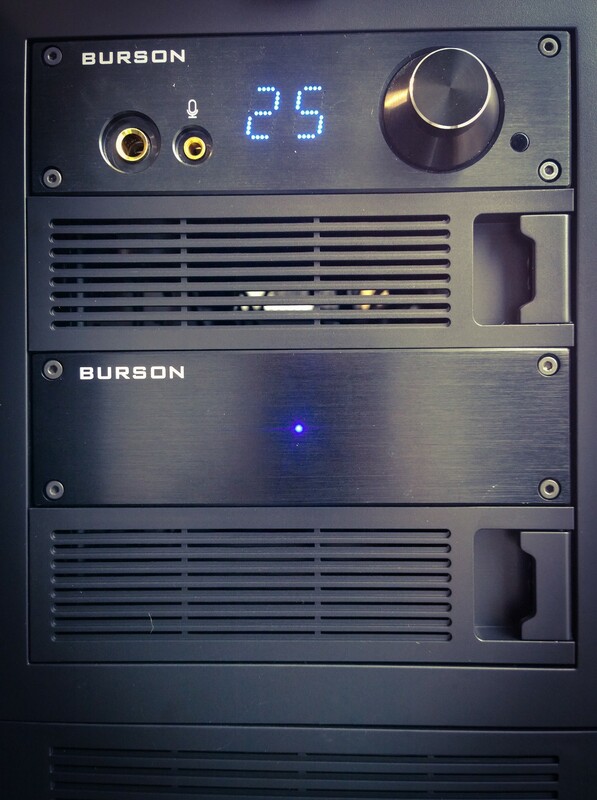 SMSL Q5 Pro: The Burson Bang sounds more musical, better bass, a lot tighter, a lot cleaner midrange. Generally more detail everywhere. Emotiva BasX a-100 : Emotiva is a really musical amp in my opinion. I really liked how everything sounds, balanced, natural nothing exaggerated. Although the bang clearly deals with separation a lot better. On the emotiva everything is blended together. In comparison, switching to the Bang you can immediately distinguish instruments or sounds you couldnt not tell apart before. Also emotiva was lacking in the bass department compared to the bang. Rega Brio: This is an interesting comparison. The Brio is a highly praised little amplifier. And lives up to the expectations for most people. It did not for me. In an audio system it's not just the individual components you need to compare, but it takes the right pairing. E.g. awesome speakers #1 sound bad with awesome amp #1 but sound incredible with a lower end amp #2 for example. It's a game of trial and error until you find the right match. For my KEF LS50 the Brio did not cut it, it felt really muddy in the mid range and bass was a bit loose. The bang in this case, despite being a cheaper amplifier matched my LS50 better! I did not get a chance to try the brio with the Klipsch RP280 so I can't comment on that. The Elex-R is my every day driver. The amplifier I decided to stick with after trying all the options above. Incredibly clear, wide soundstage, controlled bass, rythmic, has nice energy and perfect timing. I did not expect the Bang to sound anywhere close to what I am used to. Initially when I switched to the bang I felt that the mid range was not that much different. Voices were really clear and soundstage remained similarly wide. Other than the mid range where the Bang really shines, the high frequency reproduction of the elex-r is no match for the bang. Also the bass is significantly more detailed on the elex-r and more controlled, but the Bang's bass is louder. It's worth mentioning that the bass on the bang might not be as detailed but it remains tight and generally pleasing which is impressive. After all we are comparing a $1600 amp to a $499 amp, I say it fares pretty well!!!! Replaced the stock OPAMP with the Burson V6 Vivid and let it play various types of music for more than 100h to break in. Then swapped it out for the stock one and did some comparison tests. + Bass greatly reduced in quantity, but now seems tighter and more controlled, doesn't become overwhelming in dance songs. + Higher frequencies opened up a bit, have more air and don't seem veiled any more. + Even at higher volume everything stays balanced. The difference between the stock and V6 opamps is NOT day/night, it's just refining the sound signature of the stock a bit, making it overcome the slight annoyances I had with the stock one. Some people might prefer the significantly louder bass of the stock NE5532, for me it's definately a better option as the sound system the Bang is used in is for more controlled more accurate listening. I had the oportunity to try out and compare both the V6 Vivid and V6 Classic opamp in the Burson bang. Will describe how I perceived their qualities and how they compare to each other. Bonus: Comparison of the Bang vs Schiit Vidar that I got my hands on. Significantly more detailed!!! Midrange sounds further away compared to the classic, everything separates clearly. Bass is better than the classic, Highs are more detailed. It's worth mentioning that I found myself being excited about sounds I thought I didn't hear before. Midrange/Vocals seem a lot closer to you than the Vivid. Seems like everything other than vocals is more blended together, sounds more musical overall, less separated. The vivid makes you notice sounds you could swear were not there before, makes you notice the detail where as the Classic makes you forget about the details and focus on the actual song. Its hard to decide which one I prefer. I liked the vivid in most of the songs I tried it with but there were some songs where I enjoyed the classic more. The vidar despite being significantly higher power its volume seems noticedably lower. Seems less detailed with a similar soundstage. Everything seems more balanced though. Nothing is exaggerated. I would say it sounds more neutral. No matter how loud you play it, it never sounds harsh. Bass seems fuller, doesnt hit as hard but seems to fill the room more. Overall I think the Burson Bang with V6 Vivid is the best combo out of the three. The Vidar shows it's strength at really high volumes where the Bang can't keep up. The bang being driven close to it's max volume acts erratic, and seizes, making a really loud noise (not music) which doesnt stop until I shut it off. But at normal listening levels I am pretty confident that the bang is better, especially if you consider the price difference. 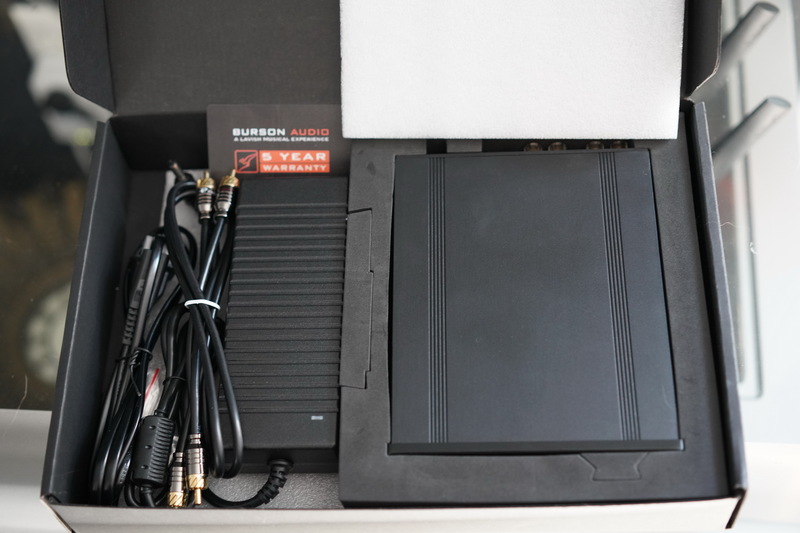 If you already have a Burson Bang, I would not consider the Schiit Vidar an upgrade, save up a bit more and go for the Rega Elex-R which is a whole different class of a beast. It remains the best amplifier I have tested/owned to date. Alcophone, Pokemonn and Light - Man like this. Big Bang! for the buck. Pros - Power to drive even large speakers reasonably well. Cons - Requires pre-amp for volume control. 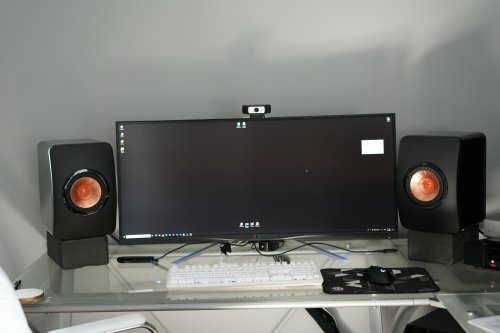 The Bang is for those like me who use desktop speakers instead of powered monitors with their computer audio setups. Paired with the Play’s or Fun’s pre-amp outs, the Bang provides 40 watts RMS of clean two channel output again with customizable sound using Bursons V6 family of Op-amps. Burson ships all three of these siblings in a black pressboard box with the details of what is inside on the top. Inside the box the main unit is protected by closed cell foam in the center of the box with a small accessory box on either side containing connectors, power supplies, and an allen wrench for opening the case should you want to change op-amps. 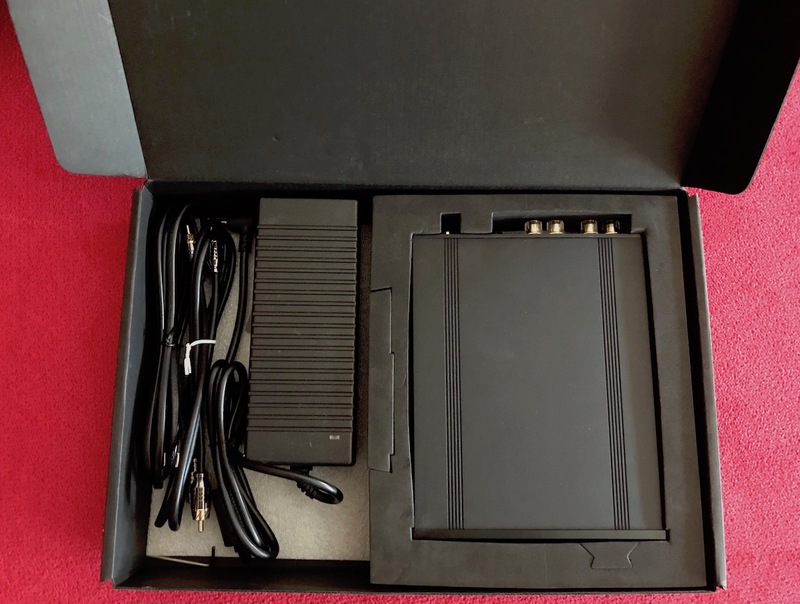 While not the heartiest box on the market, it does a good job of protecting the device for shipment and should last well unless used repeatedly for shows etc. (I’d advise purchase of a pelican style case for such purposes). The Bang ships with very few extras, but it really doesn’t need many. In the box you will find the power supply, main unit, a set of RCA interconnects, and the allen wrench for removing the unit cover. All three siblings share very similar black anodized aluminum cases which fit in a 5 ¼ drive bay in a PC if desired. All have a Molex connector for powering from a PC power supply in addition to a connector for an external power supply (provided with the unit). Each sibling has different face-plates depending on the controls and jacks present. The Fun lacks the digital display of the Play while the BANG lacks any front panel controls at all. 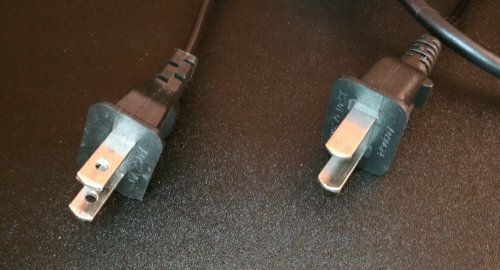 On the rear(from left to right) are the Output binding posts over the external power jack and molex connector for PC power, the Power Switch, and RCA inputs at the far right. Worth noting is the binding posts are for banana clips only and do not unscrew. The upper half of the case can be removed by removing the two upper screws on both the front and rear faceplates. I found that loosening the lower screws about ½ turn aided in lifting the top without scratching the inside of the face plates in the process. 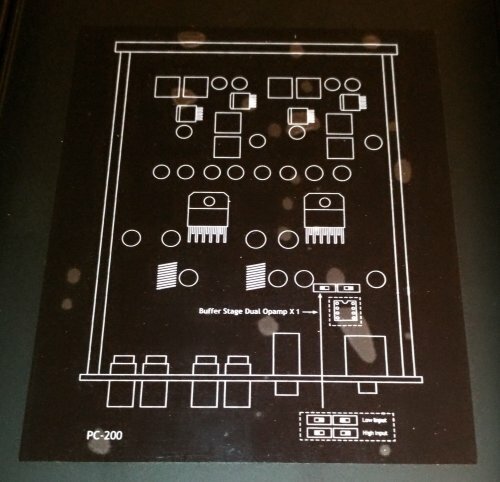 The inside of the lid has a diagram that details the components and positions of each. This is particularly useful when changing op-amps. This is certainly a nice touch as manuals are often nowhere to be found when one sets out to change op-amps etc…. Burson has designed what it calls the MCPS (MAX Current Power Supply) that per their spec does the AC to DC conversion at 170kHz instead of the 30-50kHz of more common switch mode power supplies. 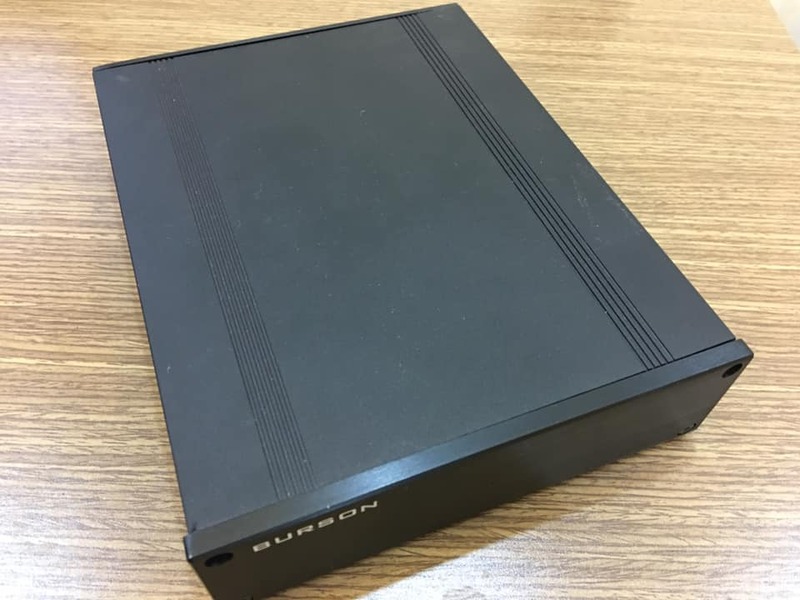 Burson’s claim is that this new supply design eliminates all noise in the audible range while still retaining the efficiency of switch mode power supplies. 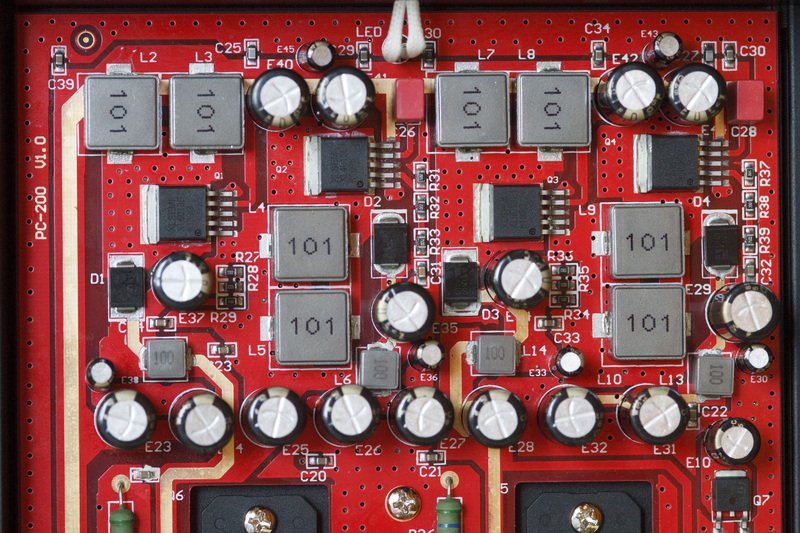 The Bang uses 4 distinct MCPS circuits to feed the Class AB dual mono circuitry. Burson touts the Bang as the smallest footprint true class AB available and its size is comperable to a lot of other vendors Class D offerings. The Bang also offers the buffer of the Cable+ system to allow for adjustment of input impedance to match your source. This is especially critical since the Bang relies on the pre-amp for volume control. Mismatched impedance is a real possibility with devices ranging from <25 Ohm to over 300 Ohm depending on type and manufacturer. The Bang uses a (1) Dual Op-amp that is shared by both channels. This makes perfect sense as it prevent mismatched or imbalances between channels that would be more probably if using single op amps in a one per channel arrangement. This does give the option of using one of Burson’s discrete op-amps and Burson offers the Bang with either the V6C, V6V, or Ne5532 op-amp. 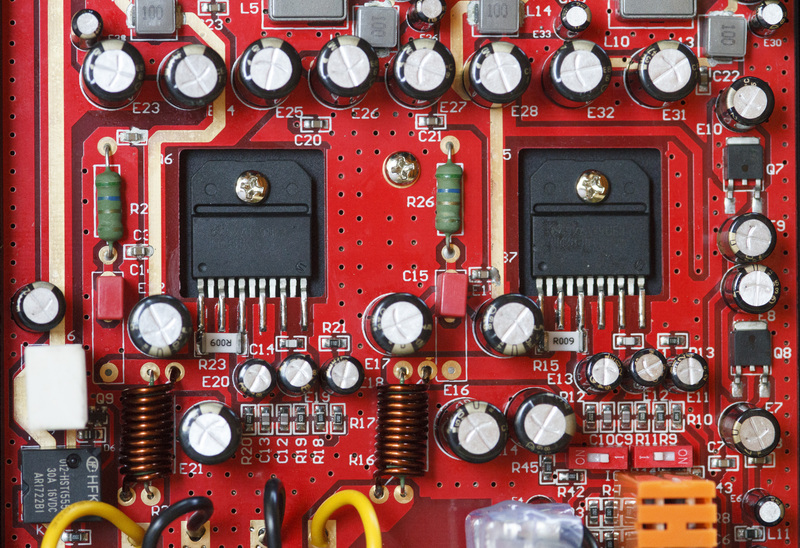 A host of others are pin compatible and Burson is one of a very few companies that encourages op-amp rolling and doesn’t void the warrantee for doing so. I found when stacking the Fun and Bang a Seasonic SSR-600TL 600 Watt fanless PC power supply did a good job of running both without any stress to the supply’s voltage rails. Burson rates the Bang at 40 Watts RMS into 4 Ohm. Since most home speakers are rated at 8 Ohm, the average output power will be closer to 30 Watts than 40, but understand this is RMS, not peak, and is a true rating rather than the inflated ratings so many consumer brands use today. I tried the Bang with KEF Q350s, Klipsch Heresy II, and even a power hungry Magnepan 3.6/R. The KEFs were driven extremely well by the Bang. The Heresy II was, if anything, a little over driven as I didn’t have nearly as much usable volume control with those as with the KEF or MG. The MG 3.6/R paired with Levinson 20.5s has been my mainstay for quite a number of years and while I love the sound, I will readily admit that at 86dB and 2.8V/m, the MGs are not easy to drive well. I fully expected the Bang to be unable to drive the MGs as they are well beyond what should be expected of it. While I would not recommend torturing this or any amp with a load so far beyond what it is designed to handle, I will concede that Burson’s claim that this amp can keep up with many amps rated at three times its specs appears to be true as I was able to get reasonable listening levels out of the MGs without any obvious distress from the Bang. 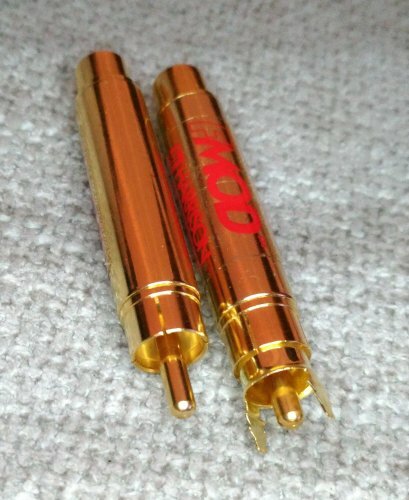 I did ask Burson if the Bang was 2 Ohm stable but have not received a reply, I’ll add it when I do. 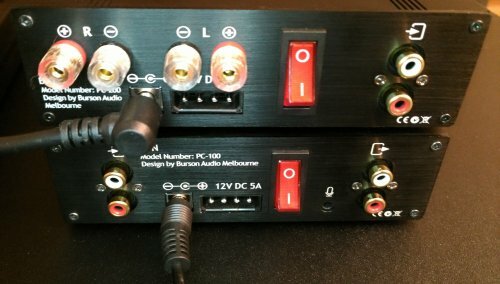 I tried all three op-amps that are offered with the Bang and found less difference here than either the Play or Fun as I think the sound is more highly dependant on the DAC and speakers than the op-amp in the amplifier. I have previously written up the Burson V6 products here, so wont re-write all those details again. Burson now has a complete line of desktop components in the Play (DAC/AMP), Fun (AMP/pre-AMP), and Bang (Power-AMP) that are extremely price competitive and rank at the top of their class in technology and design. 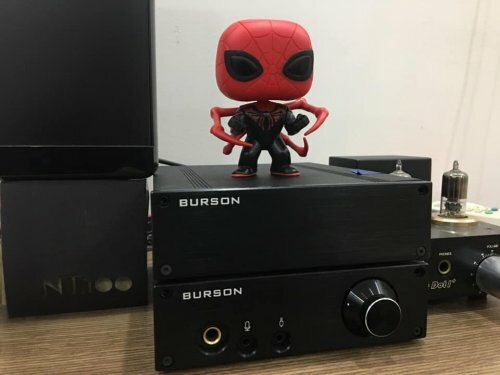 So now you have options, Play around, have some Fun, or Bang it out on your speakers, either way Burson has you covered. Pros - Pocket sized nuke audio power plant. Cons - Gain switch on the back of the unit would be more practical. 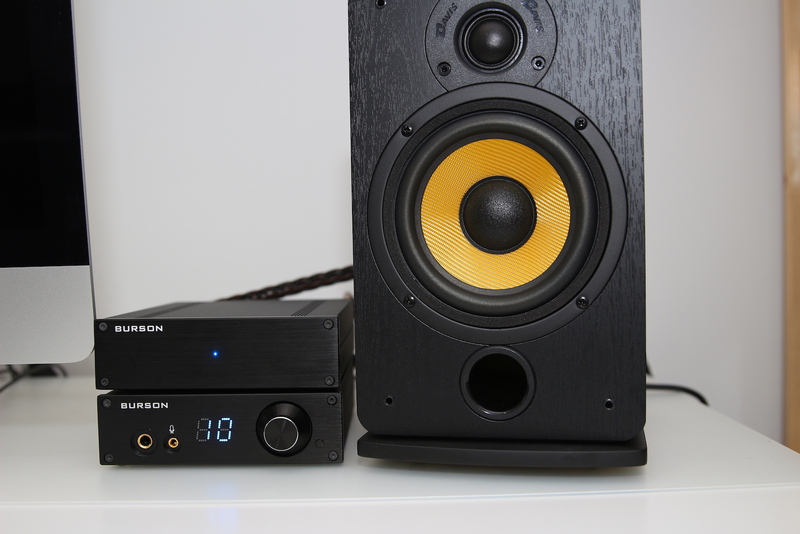 This is a review of Burson's mini desktop amplifier called the BANG, aka Honey, I Shrunk the Amp. After reviewing two other Burson's products, the PLAY and the FUN, I got yet another chance of reviewing the last piece of the stack. The BANG makes a complete statement on your desktop, combined either with the PLAY or the FUN as preamps, or any other preamp of your choice. Looking at the size of the case, you would expect this to be a class D amp, but it isn't. It is an old school class AB amp, combined with some witchcraft to shrink it's size. Power supply is outsourced, using big switching power supply which saves quite a lot of space, but it is still impressive how Bursonians succeeded shrinking this power amp so much. There is a line out and two different line-ins, as well as micro-in and micro-out. The basic version comes with the oldie NE5532. My test unit came with preinstalled V6 Classic, which makes it worth $599. 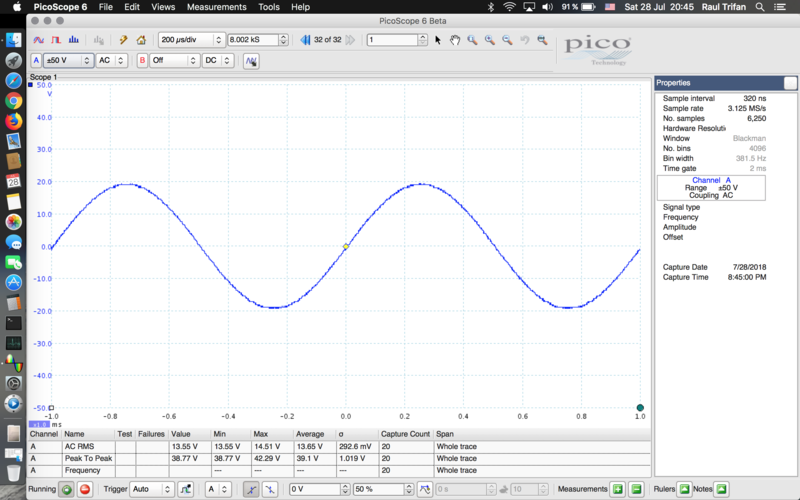 You can further do some op-amp rolling, something which to my knowledge is more common with the tubes. There are plenty of op-amps on the market, some quite pricy, so I guess this is an interesting and costly sport. The BANG features a gain switch inside the box. With standard level 2V inputs I would recommend going for the low gain and for mobile devices, which go lower than 1.5V, sometimes as low as 1V, I would go for a high gain. Default was high gain and it proved to be incredibly high, not allowing me to go above 20% of the volume control of the PLAY. The gain switch is a handy feature, but it would have been much better to have it outside the box, like on the back panel. Otherwise if you intend to use different sources, you have to reopen BANG's case every time you want to change the gain. I've tried the BANG with the PLAY and the FUN as preamps. The PLAY is a dac/preamp, the FUN only a preamp. Both stacks look pretty nice, but sonically for some reason the FUN/BANG combo was much better match. The PLAY/BANG was plagued by some digital background noise, while the FUN/BANG was dead silent. Turning the volume control of the FUN to the max, there was impressive black background. Now to the sound impressions. As with the PLAY and the FUN, I went through many different music styles, but was mainly focused on the reproduction of the symphonic and jazz upright bass. What struck me first was the power, huge power. Where does it come from? I couldn't turn the volume more than 20-25%. The soundstage is big, wide and realistic, instruments imaging very clear. It is transparent and clean power, making it ideal for near field listening or even for a small home studio. Treble was slightly grainy but what I understand, Burson's op-amps need some 100 hours of burn-in, so I expect this might improve with a time. Mids were very detailed and informative, very neutral and clean, with fast attack on the notes. Now coming to the section which took more time to get an opinion. The bass is strong, powerful and boomy. It goes very deep. The BANG gives much flesh and juice to the sound of either plucked or stringed bass, which is good, but also has somewhat unusually long reverberation, which can make the sound colored. With brighter recordings and edgier bass lines, the BANG helped a lot adding some warmth to the mid-bass, but with complex symphonic passages, it could loose the control and articulation. But here we are talking about splitting hairs from a double bass aficionado. For most of the time, the BANG was very enjoyable listening experience, which always made me forget how small this thing is. And that's exactly the point. Putting such a small powerful nuke power audio plant on your desktop, combined with either the PLAY or the FUN, will give you a complete space saving, desktop decluttering solution. 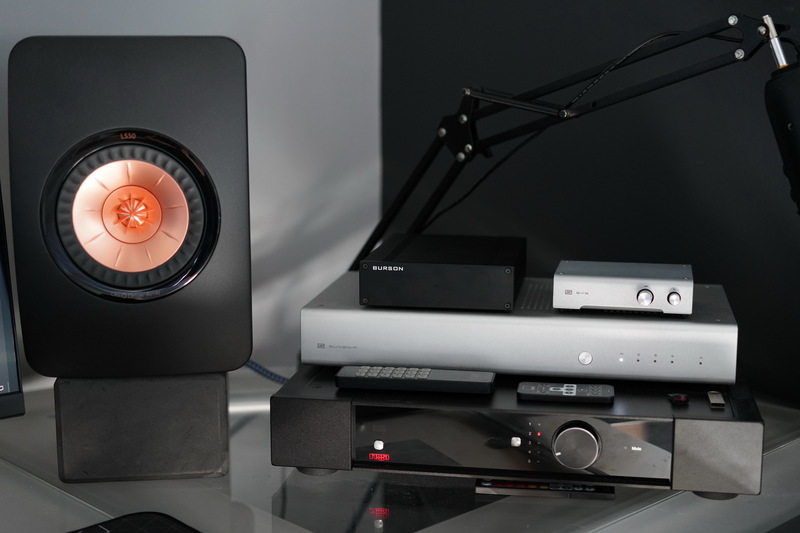 PLAY + BANG gives you all you need on your desktop, having dac/preamp/amp. FUN + BANG need an additional dac, but sounds better. In any case hats off to Burson. DjBobby and raoultrifan like this. Mij-Van, Eiffel and raoultrifan like this. When I’ve tested the Burson Play around one month ago I was kind of impressed by it’s small footprint yet with a really big and bold sound signature. I’m really glad that Burson started thinking out of the box this last year and sincerely I dig every new product they released so far such as Play, Fun and Bang. 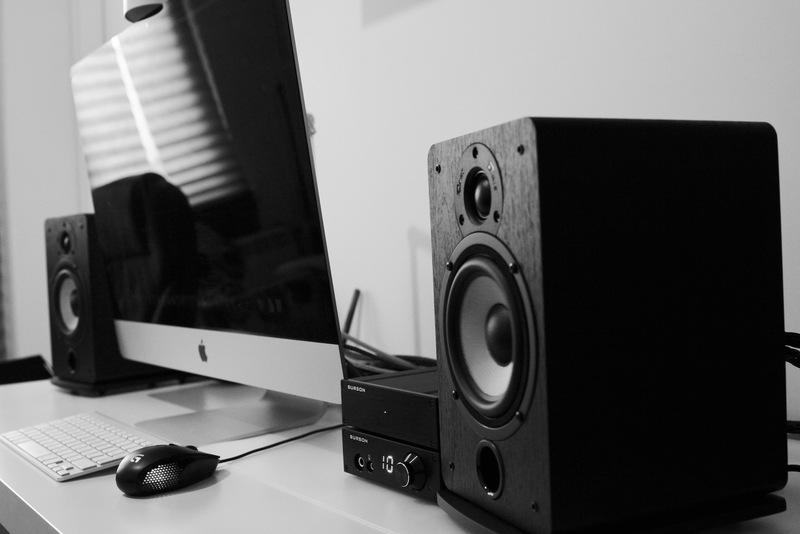 Small footprint and lower desk space doesn’t mean you’ll get a lower quality sound with boring dynamics. When I heard the Play it was everything you’d want but not boring at all and I do hope the same can be said about Bang and Fun. Burson Audio was kind enough to send us the Bang and Fun to test the hell out of them and we did exactly that so at this time my review is concentrated around the Bang power amp that I am enjoying for a week or so. 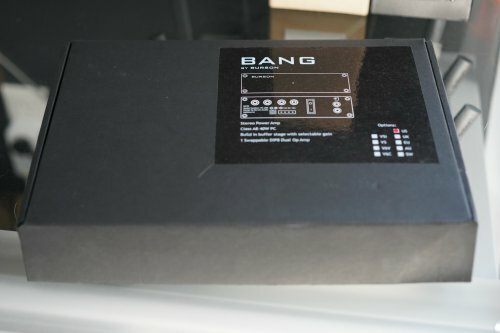 Bang is quite small, it has the same size as the Play and Fun but when I connected it to my Davis Acoustics Eva speakers I was a bit shocked by how much gain and power it has compared to my upper class Cambridge Audio Azur 851A. 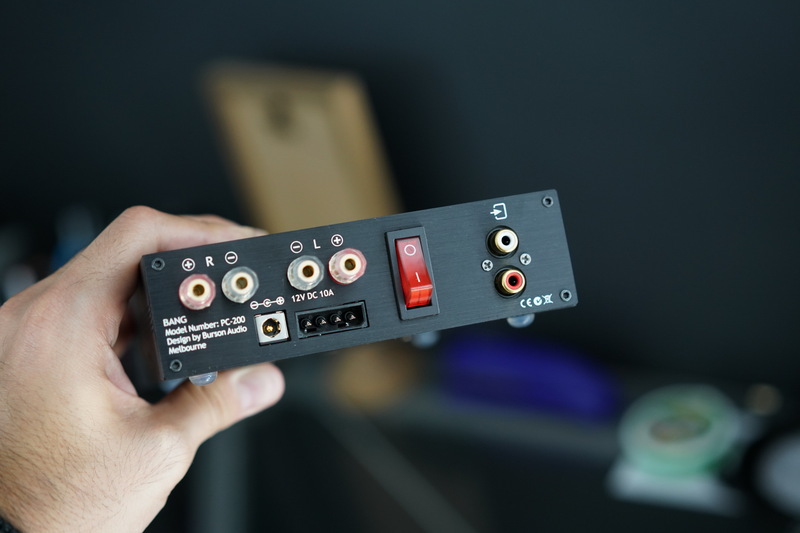 I will test the Bang connected directly to Play and to my digital preamp inside Matrix Audio X-Sabre Pro and later will compare it a bit with the Cambridge Audio Azur 851A. I agree and I can attest that, using my Davis Acoustics Eva speakers together with Play and Bang I can’t go higher than 20 volume out of 99! Take into consideration that with my Cambridge Azur 851A I was using 50 out of 100 volume for the same SPL in the same room but with a different source. Using four sets of Max Current Power Supplies (MCPS) developed by Burson, Bang delivers overwhelming power, speed and details. Taking into account it’s small size and weight you might think it uses a Class D amplifier stage, but you would be wrong. Bang is using a purist Class AB output stage for an organic, transparent and musical sound. Bang is quite versatile as well because it has an internal gain buffer stage with selectable impedance levels. 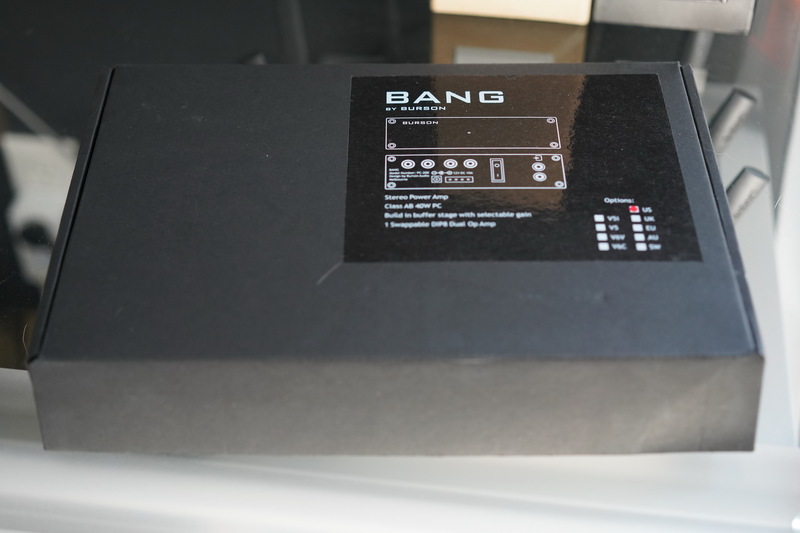 It doesn’t matter if you are using a portable DAP, a desktop DAP or a high performance pre-amp, Bang will work with any of them giving you’re the perfect performance and volume control every time. 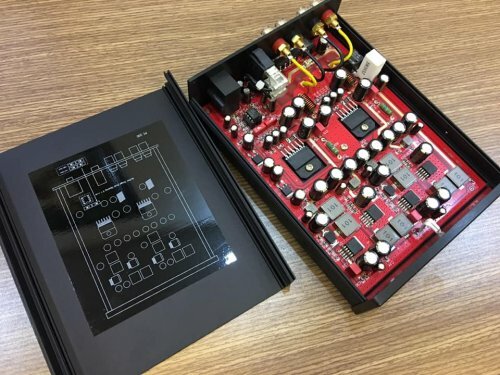 Bang’s input buffer stage in basic form is controlled by a single NE5532 op-amp but you can change it to your liking with a better performing op-amp like Burson’s own V6 Vivid Dual or V6 Classic Dual op-amps to squeeze the best of it. I am using the basic NE5532 version, but don’t worry and in it’s stock form Bang impressed me enough. 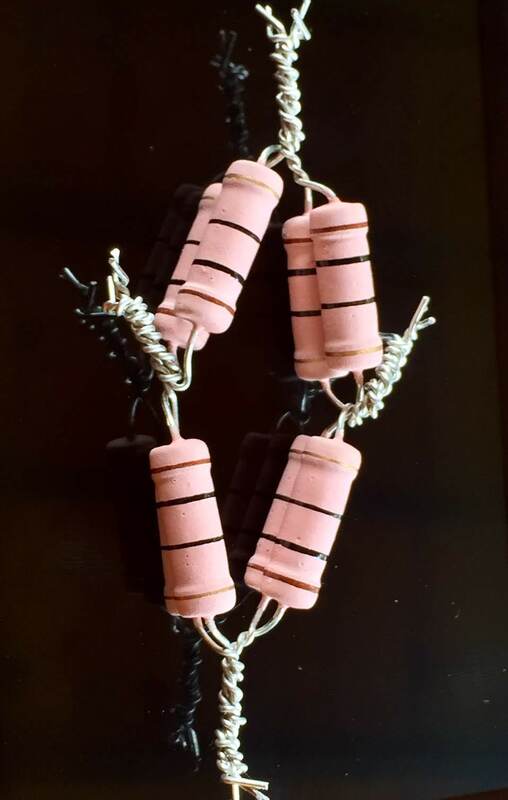 It wouldn’t be a Burson device if it would not use highest performance ELNA aluminum electrolytic capacitors and Vishay resistors, we literally see them in every Burson product. Burson states that Bang has around 40W of power into 4 Ohm load and around 29 W into 8 Ohm loads but after hearing it with my speakers I am thinking they didn’t get the numbers right as it sounds much more powerful than that. 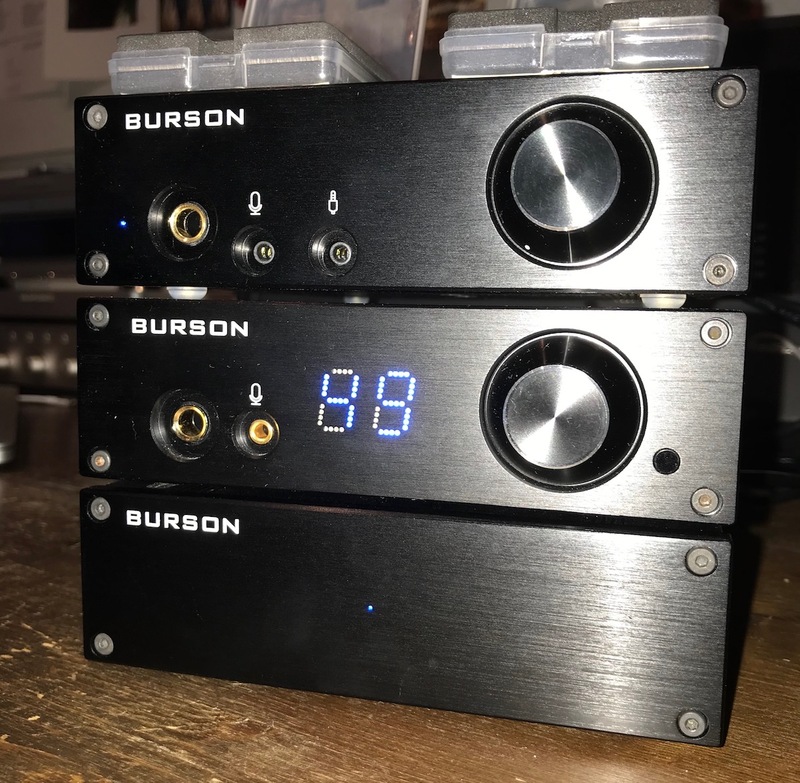 There are two possibilities: It has a higher power output and Burson somehow didn’t measure it right or the second one would be that Cambridge Audio inflated too much their power ratings to have a higher sales numbers on their hands. We will probably never know the truth but I am betting on the second possibility. I am kicking myself in the nuts of not having at the time of writing a pair of stand-floor speakers as I anticipate Bang would drive those to ear bleeding levels and have some power reserve left. For my Davis Acoustics Eva, Bang is too much, much more than enough, at 15% volume my desk trembles, at 20% volume my neighbors are knocking on the wall to lower my volume levels, it has gobs of power! I want to add that for a better impedance matching I used the Burson Cable Pro+ between the Play and Bang to better evaluate its acoustic properties. Lets go with a Bang shall we? As you probably guessed Bang drives my Davis Acoustics Eva with tons of headroom left on the volume dial. 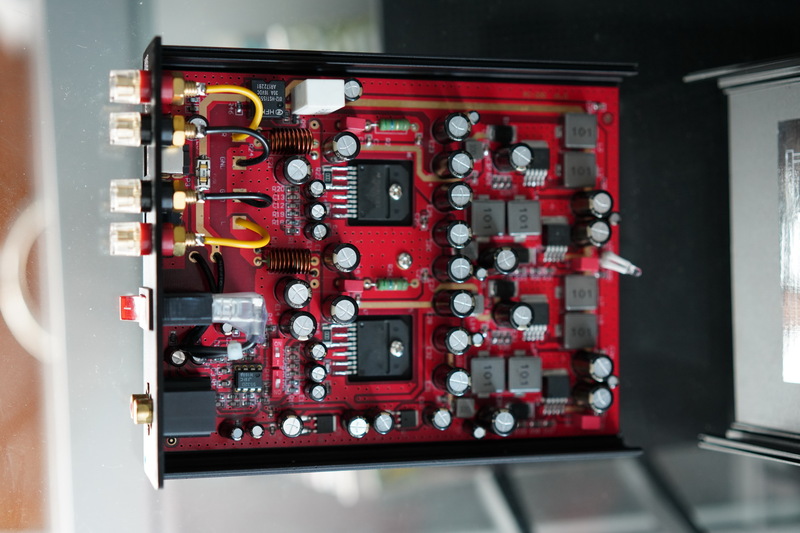 I did test it with Play, Fun and with my digital preamp inside the X-Sabre Pro DAC. Play + Bang was the easiest setup to play with as you have everything you need for a small yet powerful setup for all your headphones or speaker needs. I think the preamp section of Burson Play is too powerful as I never got more than 20 on the volume dial. First thing I noticed is that Bang is free of any noise; even at lowest volumes background is free of any noise or hum. Secondly after pressing play I’ve heard an easiness of sound that often is heard only in Class A or Class AB amplifiers, but wait Bang is a Class AB design so this makes sense now. Bang has a really good flow with any type of music, it’s like any music fast or slow, with longer or shorter decays will always sound natural and easy going. It is a type of sound that you don’t want to analyze but just relax and enjoy for a longer period of time. Actually this just happened to me, I sit down trying my best critically evaluating the Bang on all its sides, but after few tunes I brought a glass of wine, put my legs on the table, took the keyboard away and just enjoyed the music for the rest of the evening. The next day I put some Subcarpați – De Dor Și De Bucurie and involuntarily started tapping my feet. This simple yet complex tune has everything from the frequency response point of view. From lowest sub-bass to the upper treble I didn’t notice any dips or rises in the FR, so I can’t say it lacks or adds anything into the mix. However I felt a stronger bass response and a hint of naturalness on midrange that again is heard mainly on high quality power amps. There are few seconds at the start of the tune where sub-bass rumbles a bit longer than normal and I was curios if it will distort, it didn’t, way to go Burson. Actually sub-bass response is really good, in my opinion it has the right amount of decay and rumble. Same can the said about the bass response. Trying the latest Infected Mushroom album, listening to Groove Attack track at the 01:00 minute mark a deep and clear bass response should be heard and with the right gear it really shakes you up. Bang passed the bass test with flying colors. Midrange performance is where I think Bang shines the most as it adds just a little character of its own to make it unique sounding. Yes, that is right, midrange goes a bit upfront compared to the rest of the spectrum. Most of the time the attention will be caught by the musical midrange performance, can’t say I dislike that, but can’t say it’s a linear performance too. Depending on the taste, if you prefer a slightly musical performance Bang will be to your liking. My speakers do not have a lot of midrange presence so the Bang actually helped a bit. Voices and string instruments have just a tiny longer decays than how I would call natural decays, the notes are lingering just a little bit longer than how for example I’ve heard on Play but that is all right. Bang sounds quite fast, but it’s not reference material for sure in term of speed and impact. My Cambridge Azur 851A sound faster and kicks harder but it’s also 3 times more expensive so it should not be a surprise. Truth to be told I was immensely enjoying the Bang with everything from fast to slow music. Even if decays are a little bit longer it doesn’t mean sound will be muddy or uncontrolled. With Bang it was quite the opposite. Bang almost never sounds crowded or muddy. But possibly more importantly is that it has lots of control over speaker transducers, I never experienced sloppy dynamics or any kind of muddiness. In this regard Bang stays among the clearer side of power amps I’ve heard in the past. Treble in my opinion has the right amount of zing and energy. It is never too edgy and abrasive but always just a bit crispy and clear. I would probably want just a tiny bit more energy up top to be called a linear performance. I think it will work well for bright speakers and with linear ones, with midrange heavy speakers it might be too much, it should be tested in advance for a good match. 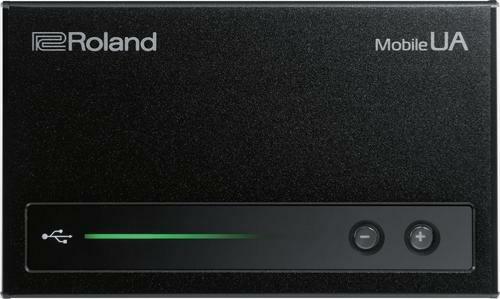 Soundstage performance is better than expected; especially looking at its size and at those power ratings. It never sounds tiny or crowded, the stage is medium to large in size and it fills the room quite nicely. I tried my speakers in two rooms, one that has around 13 mp and one that has around 34 mp, in both rooms but especially in the bigger one the sound really opened up and a real sense of scale was heard. The next day I decided to use the Bang with my reference DAC - Matrix X-Sabre Pro that also has a digital preamp section. Well the stage opened up even more, sound became not just wider but much more deeper. I started hearing voices not in front of my speakers but behind them, a weird but interesting effect. Speed ranked up, impact was better and the FR overall became more liniear. More details could be picked up and sound became even more controlled, it should not come as a surprise as X-Sabre Pro is much more expensive than the Play Basic. Burson Bang goes for 500 USD/EUR and Azur 851A for 1500 USD/EUR so it is not a fair comparison at all but an interesting one. Using the same source (X-Sabre Pro) I finally got a better sense of power and scale with Azur 851A. I had more volume with Azur 851A but not much more as I was expecting. Azur 851A kicked a bit more and sounded more linear. However Burson Bang sounded more…alive, it has a touch of warmth that could really help in some situations. What really impressed me is that Bang sounded as clear as the Azur 851A. Not a single micro-detail was missed, not a single note was unheard and for that I think Bang punches way above its weight and price point. 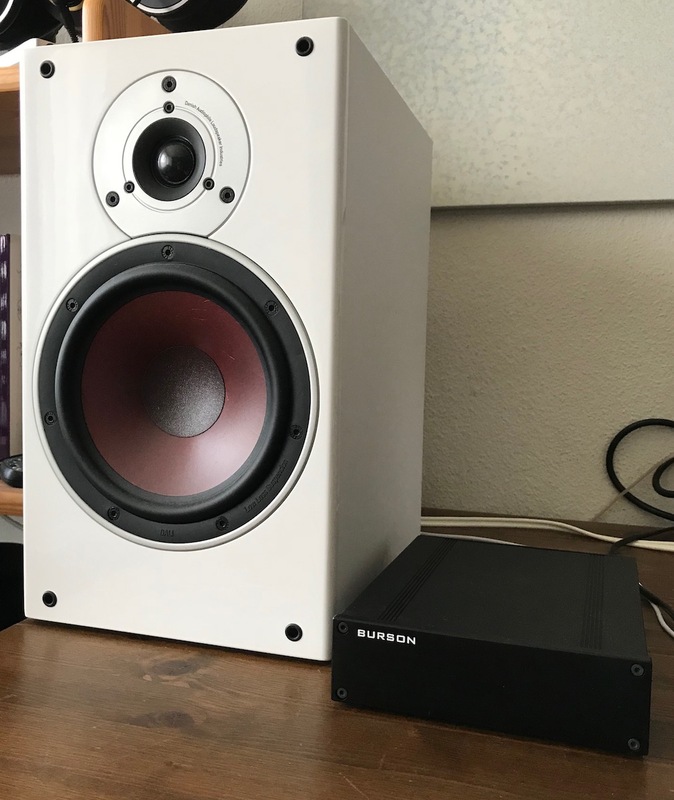 For a simple and elegant desktop solution I can recommend enough the Burson Bang, it is just perfect in a small environment, hell it even worked great in my living room as I didn’t hear any soundstage or scale restrains. It always sounded big and bolt, it is exactly how Burson gear always sounded. Having bogs of power, a large soundstage and a natural tone, you really can’t go wrong with the Bang. Burson again goes with a Bang! Eiffel, DjBobby and raoultrifan like this. Hi ! About the hum/hiss with Play - have you tried to "play" with the gain switch ? Unbelievable power packed in a small footprint. Best way to declutter your desktop. Cons - Damping factor too low. 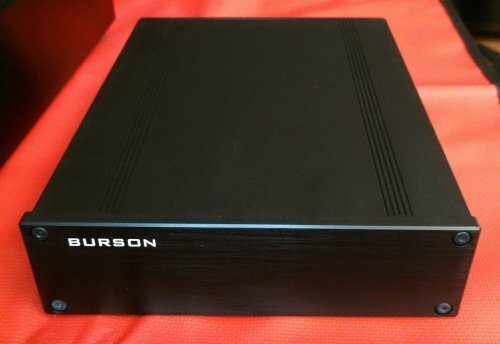 This is a review of the Burson Audio power amp BANG, the last unit from the Burson's trilogy, The Lord of the Desktop. In previous episodes we have seen the Burson PLAY and FUN and now we are completing with the power amp named the BANG. The BANG is a Hobbit of the Class AB power amps, packing respectable 29W on 8 Ohms and 40W on 4 Ohms. For all out there, who like myself strongly dislike the sound of the Class D amps and still want to claim their desktop space, this might be the solution we have been long waiting for. I will not go into a discussion why I have strong animosity against the Class D amps, but I will just mention that I have tried many of them, famous brands and costlier designs which simply didn't work for me. Therefore I ended with an awkward solution - I put the full size HiFi amp and components on my desktop, eating half of my desktop space, just in order to have a decent sound. 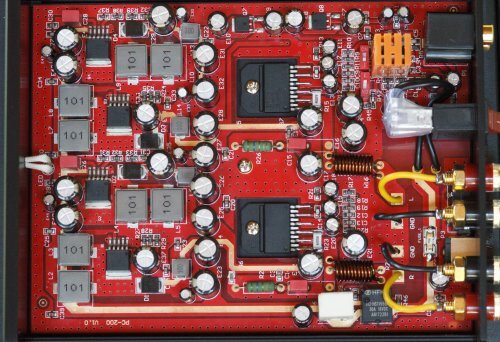 That's why I was very intrigued and I have to admit extremely sceptical, to test and review the BANG which claimed full AB power in a package one might expect from the Class D amps. The BANG came in almost identical package like the previously reviewed the PLAY and the FUN, except for an oversized switching power supply. The power supply is indeed huge, but you can easily hide it under or behind the desktop. The unit itself is of exact size as the PLAY and the FUN and forms together a nice looking stack. Having on my desktop both full size Class AB and one emergency Class D amps, I was curious to compare the sound with the DALI, Epos und KEF speakers. The BANG is only a power amp, with RCA line inputs. You can connect any source with a volume control, analog or digital, but it is more practical to connect a preamp, like Burson's PLAY or FUN. 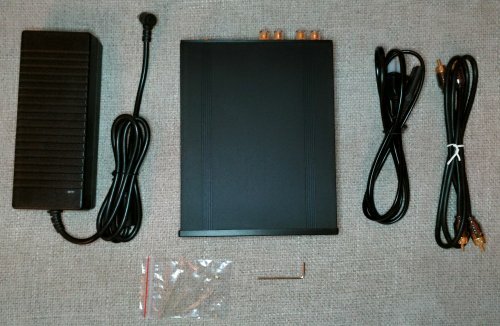 The price is $499 for the basic version with the NE5532 and goes up to $599 for the V6 Vivids or Classics upgrade version. Since I was using both the PLAY and the FUN with the V6 Classics, I have decided to stay true to the line, and therefore tested the BANG with the V6 Classics. First of all this small Hobbit is powerful, incredibly powerful. This was one of the moments, when you simply don't believe your eyes and/or ears. Such a small box, punching so much power? The power and control was just unbelievable. Lot of punch, lot of headroom, highly dynamic. The soundstage was big and wide, the sound reverberant and rich with deep bottom end. Mids were clear and dense, the treble slightly on the bright side. But this was unmistakable the Class AB sound, transparent, vivid, alive. It looked so tiny compared to my both desktop powerhouses and still had more than enough muscles to compete with them. There was great transparency on the top, good stereo separation and clear imaging. The instruments have nice rich body around them, the voices lot of breath. Only thing which was unusual for an solid state amp was damping factor. On the Burson website, the specs for the BANG stated an output impedance of highish 1.5 ohms. This would mean an unusually weak damping factor, letting the bass cone swinging to much and too long. Using Dali Zensor 3 speakers with 6 ohm nominal impedance, this would mean a damping factor 4. The bass reproduction was somewhat wobbly, with high reverberation, which was much closer to the sound of my tube amps, than what you would expect from a solid state amp. While on some tracks the bass was a little bit out of control and unwieldy, I can imagine that small desktop speakers with modest sized bass cones might actually benefit from a small bass boost. The sound was dynamic, upfront with wide soundstage and rich colors. Sometimes the sound signature was a little bit too energetic and the soundstage had more width than depth. 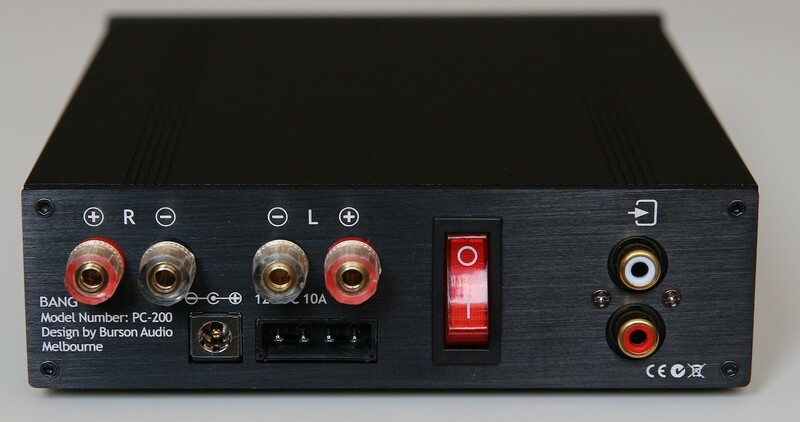 On the other hand, this is a great desktop solution: headphone amp with DAC included, digital volume control with nice display and remote control, connected to the BANG to power your desktop speakers. 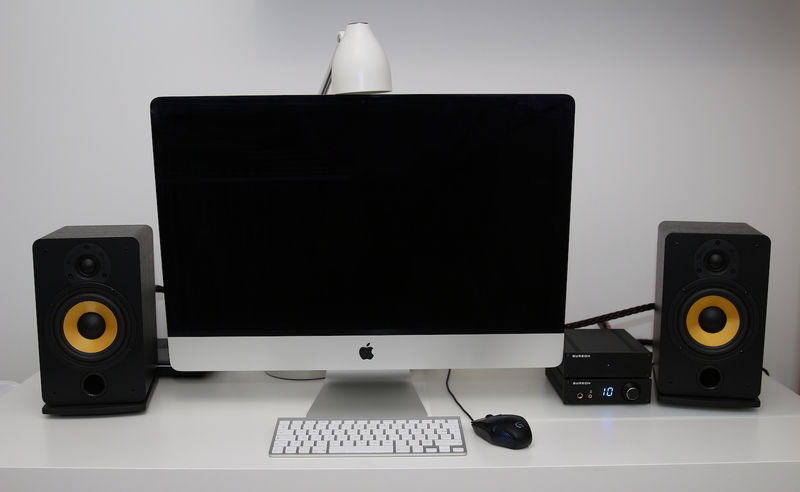 This might be everything you need for the space saving, decluttering desktop solution. Now the soundstage got deeper, the sound was not so upfront anymore but got more direction and layers. The imaging was exemplary, much above the price bracket. The treble was also a little bit less grainy. This combo made me foot tapping and put a smile on my face. 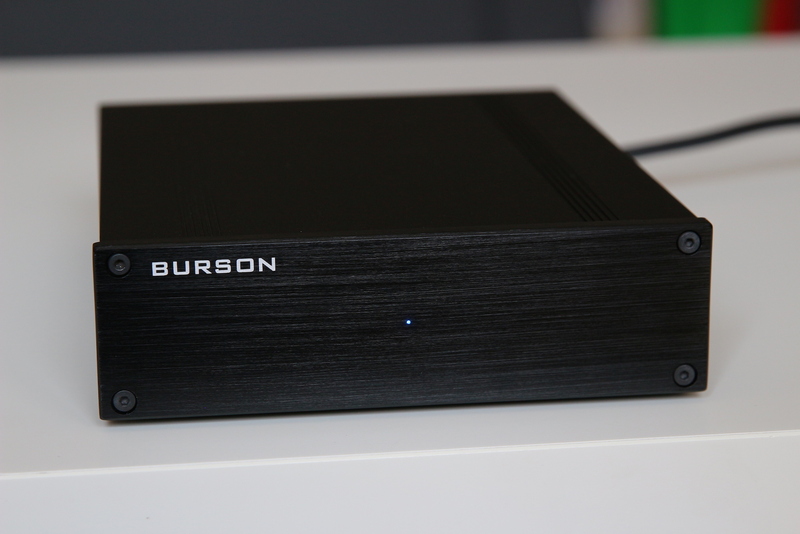 Burson Audio has produced 3 outstanding desktop products, which might be combined or stacked. They pack huge power in a small package, helping you save a lot of desktop space. 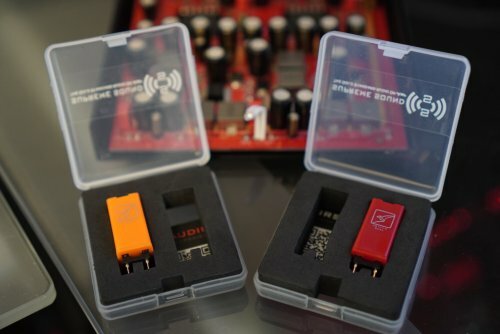 While the PLAY - BANG combo might be the most economic solution, giving you in only 2 small boxes all you need on your desktop, my heart goes to the FUN - BANG combo which will need an additional dac. Even with an added dac, it still takes very little space, still producing seriously audiophile sound. While I am not a believer that one size fits all, or one brand fits all, the Burson might be an exception. I could easily imagine my desktop exclusively consisting of Burson products. Kind of Bursonification. snellemin, Mij-Van, raoultrifan and 2 others like this. Nice collection of gear you have there. Enjoyed every word of your review, big thumbs up! Mulţumesc Just read your review of the PLAY plus some more, with a help of Google Translate. Great website, great work! raoultrifan and DarKu like this. Love reviewing audio gear and listening to music, that is all.